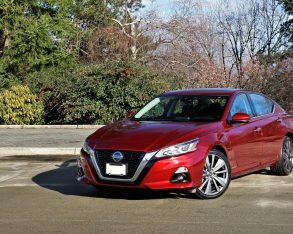 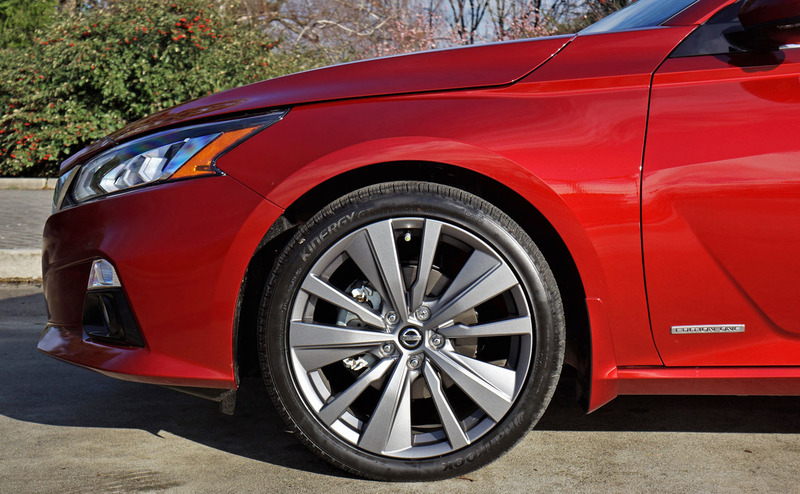 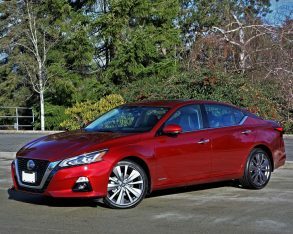 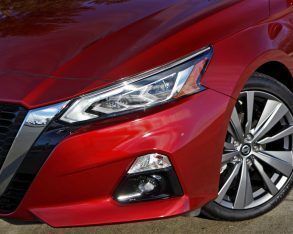 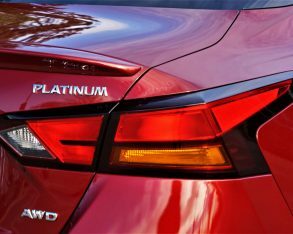 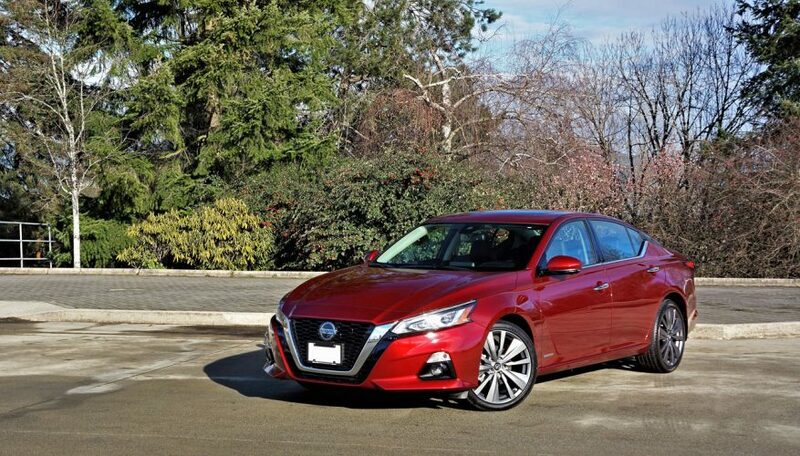 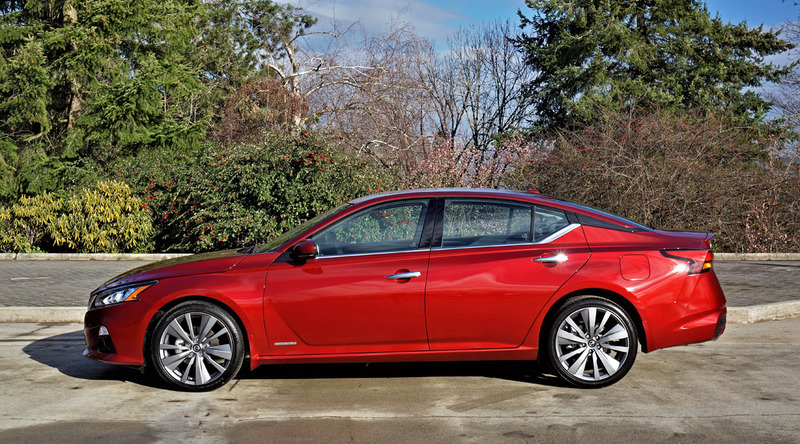 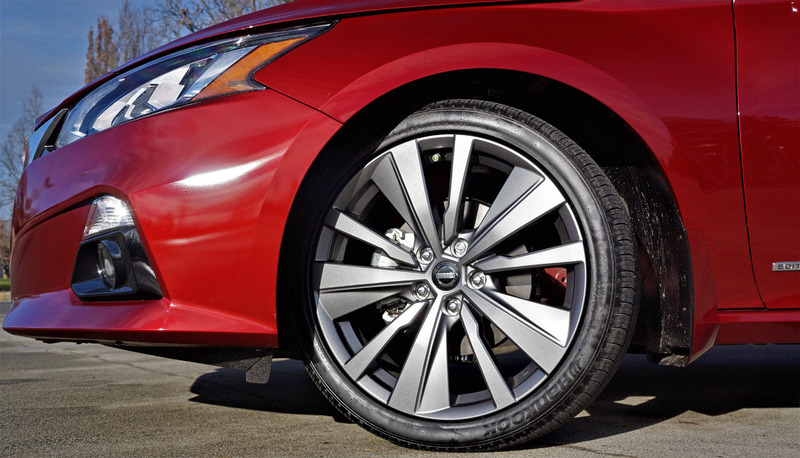 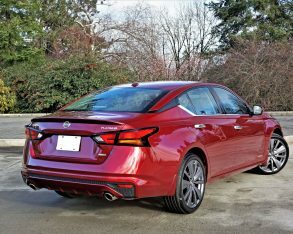 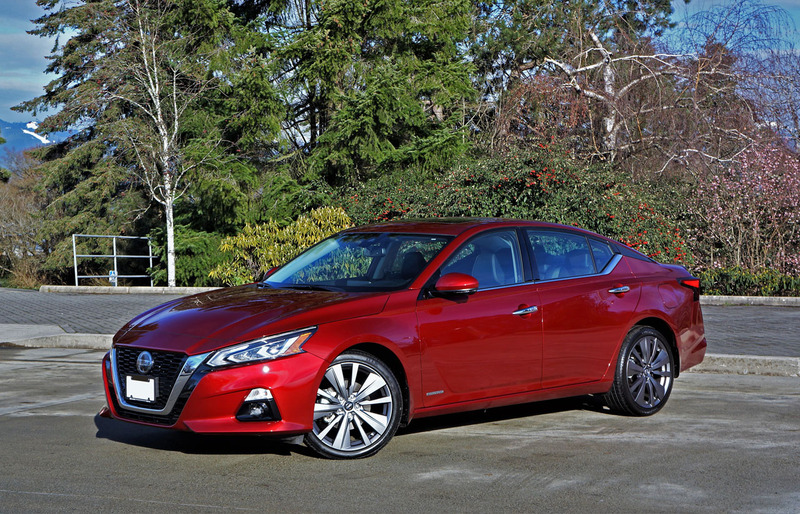 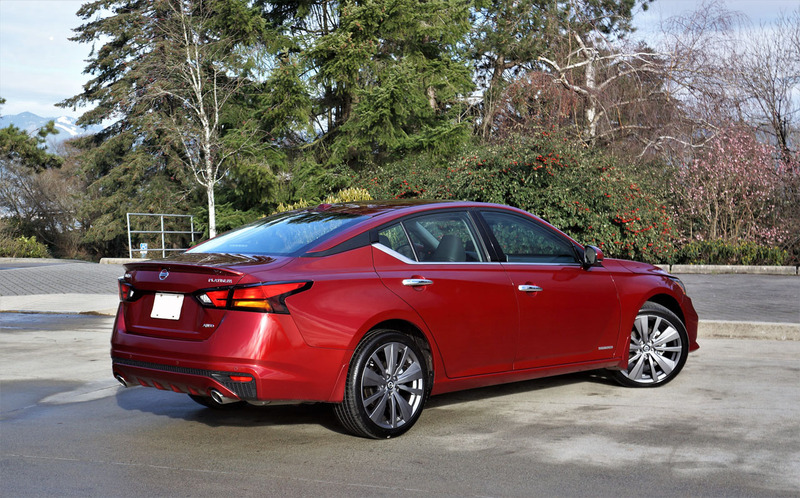 Nissan’s Altima has long placed mid-pack in popularity amongst the dozen or so mid-size family sedans available to Canadian new car buyers, but the dramatically styled new 2019 model, featuring standard all-wheel drive, should help move it closer to the top-selling Toyota Camry and Honda Accord, a target made more achievable due to key rivals Ford and GM cancelling their third- and fifth-place Fusion and Chevy Malibu respectively. 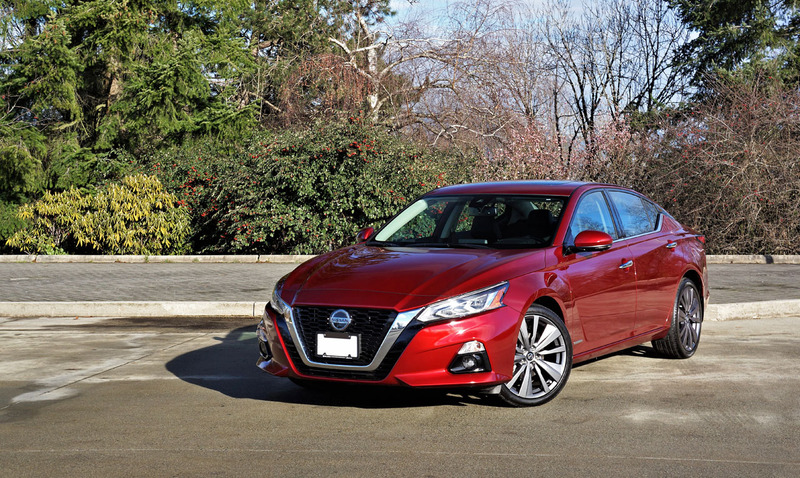 Certainly the mid-size family sedan segment has taken a beating in recent years, but imported brands are staying the course while domestics are pulling up shop and walking away from the entire car market despite comparatively strong sales. 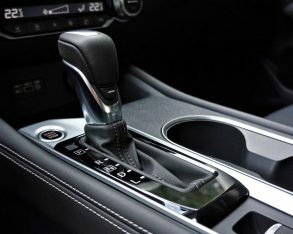 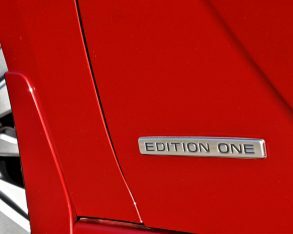 Ok, it’s not as if Ford and Chevy have been selling anywhere near as many Fusions and Malibus as Toyota and Honda delivered Camrys and Accords, the latter models’ numbers reaching 14,574 and 13,504 units respectively during model year 2017 (2018 numbers have yet to be tallied), but the 9,736 Fusions and 8,152 Malibus certainly proved stronger than the 7,827 Hyundai Sonatas or 6,626 Altimas sold during the same 12 months, or for that matter the 4,496 Kia Optimas, 4,145 VW Passats, 2,842 Chrysler 200s (a domestic sedan that has also been cancelled), 2,541 Mazda 6s, 2,451 Subaru Legacys (the only other car on this list with standard AWD), and 695 Buick Regals (strange GM chose to cancel the Malibu instead of this sales laggard). 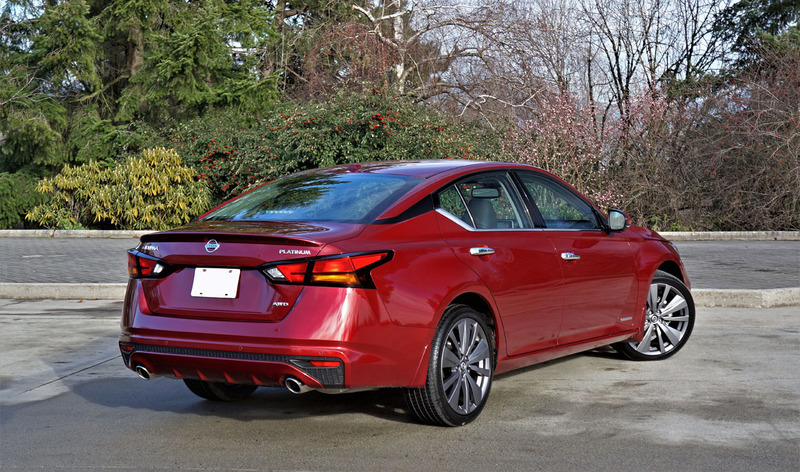 Dubbed Intelligent AWD, the Altima’s four-wheel propulsion system utilizes an advanced torque split design that automatically distributes power from 100 percent up front and zero at the rear, all the way to an even division of 50 percent front to rear. 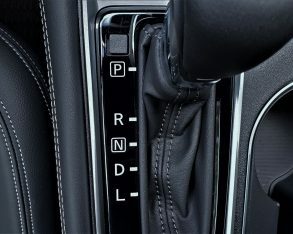 The bias depends on road conditions and resulting wheel slippage, with the default system being front-wheel drive to save on fuel and reduce emissions. 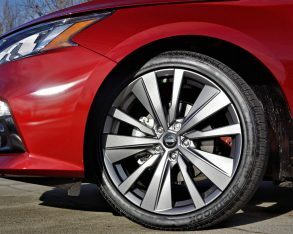 Additionally, Nissan claims its new Intelligent AWD works seamlessly with the Altima’s standard limited-slip differential, as well as its Hill Start Assist system. 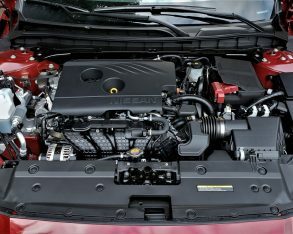 Powering it all is a 2.5-litre four-cylinder engine that’s good for 182 horsepower and 178 lb-ft of torque, which is 9 horsepower and 3 lb-ft stronger than the engine it replaces. 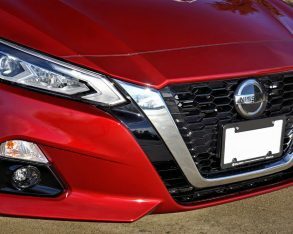 Nissan promised smoother and quieter operation, plus better efficiency than the outgoing four-cylinder, and I must say it lived up to such claims during my test. 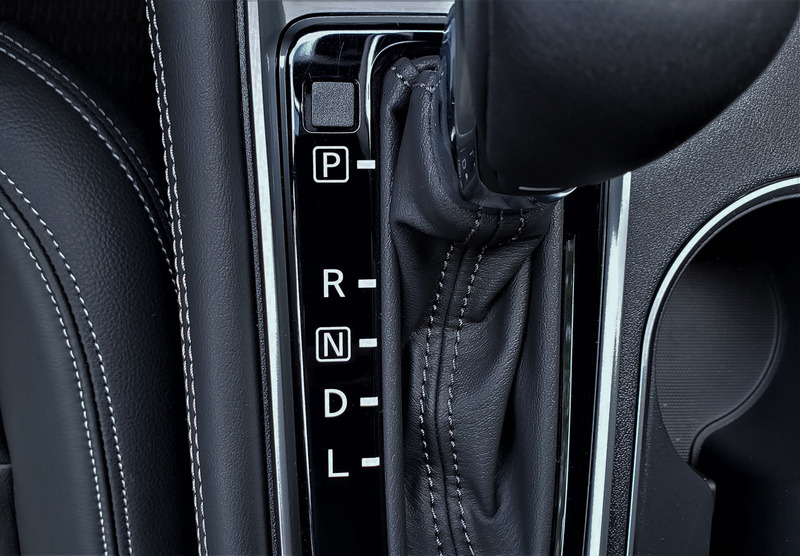 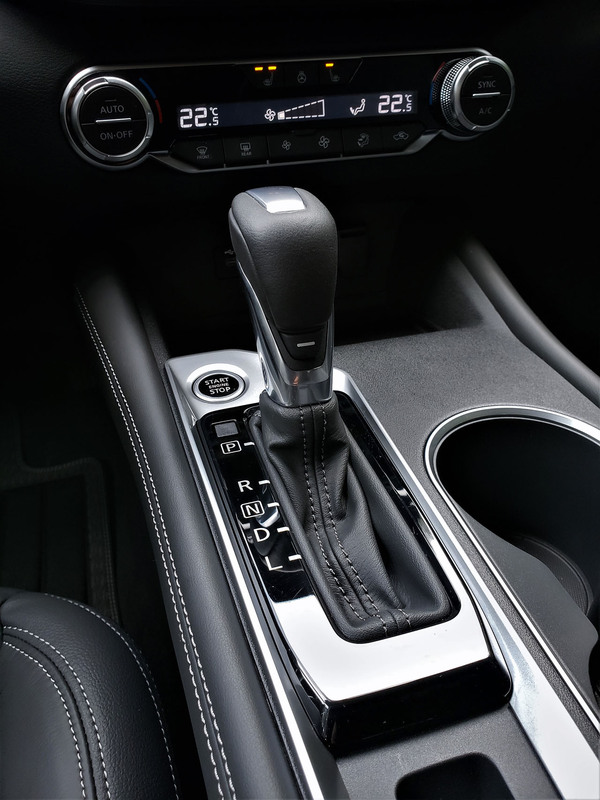 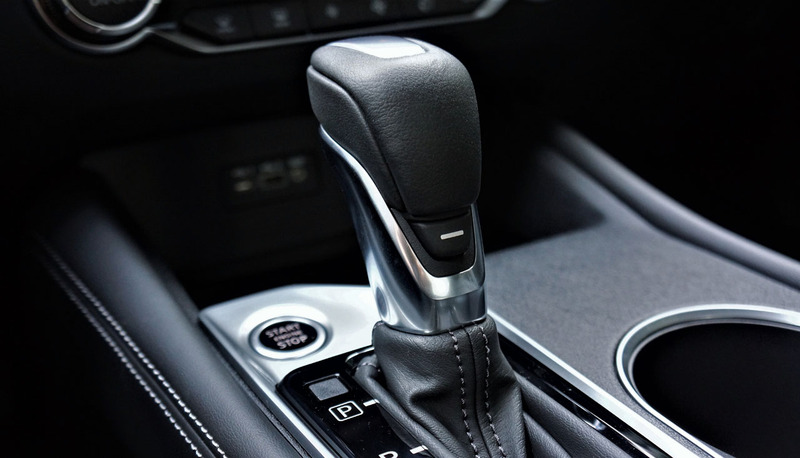 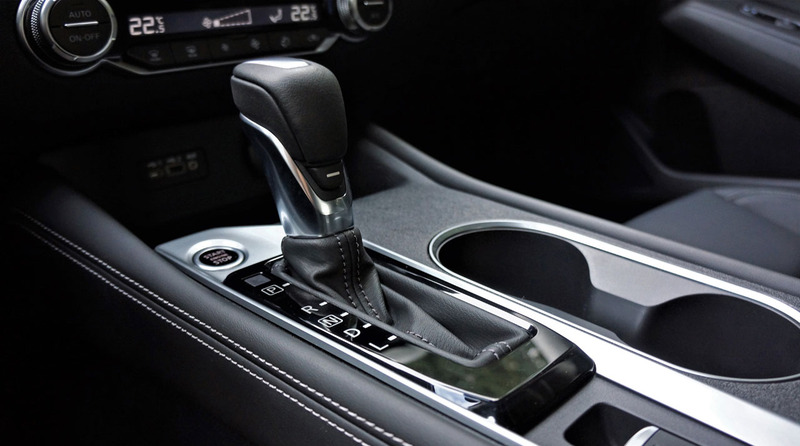 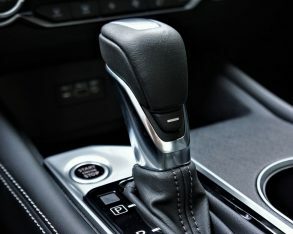 Smooth is probably the best word to describe the updated powertrain, but much of this has to do with the revised Xtronic continuously variable transmission (CVT) that’s ideal for drivers looking for relaxed comfort, ease of use and efficient operation. 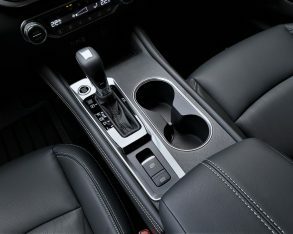 In default mode it goes about its duties with near seamless perfection, the CVT’s “seams”, or rather shift points, only added in order to mimic the feel of a conventional automatic transmission, as has been en vogue in continuously variable camps for a number of years. 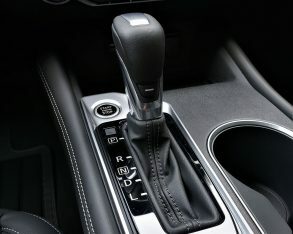 It all results in truly realistic shift intervals that never had me missing an old-school automatic. 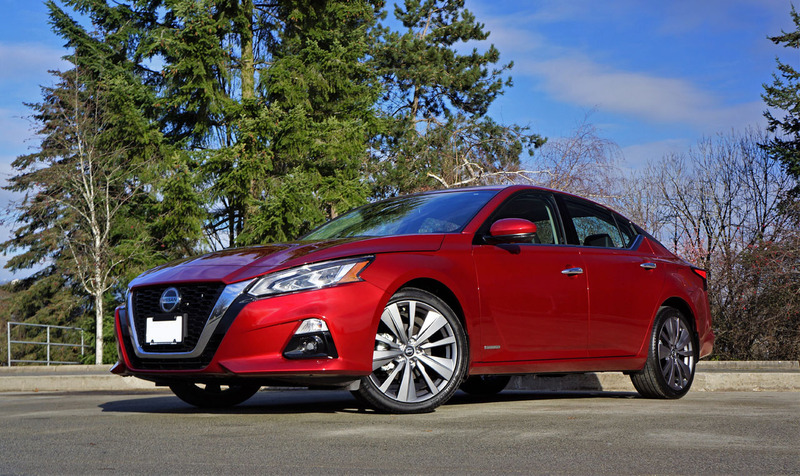 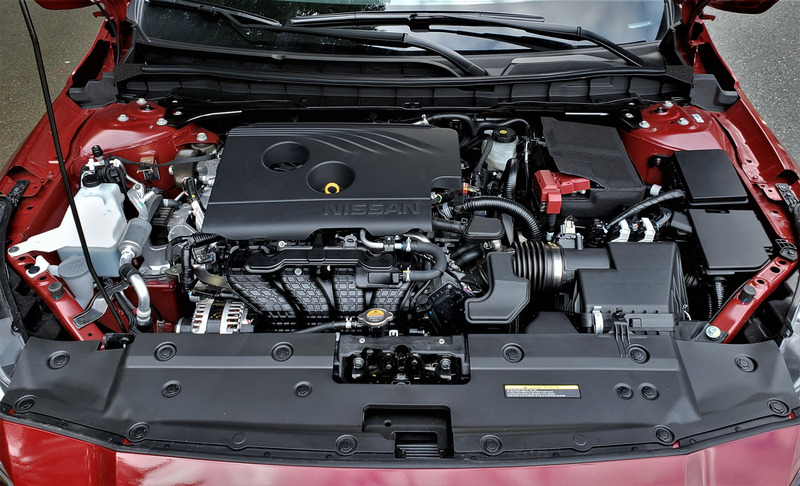 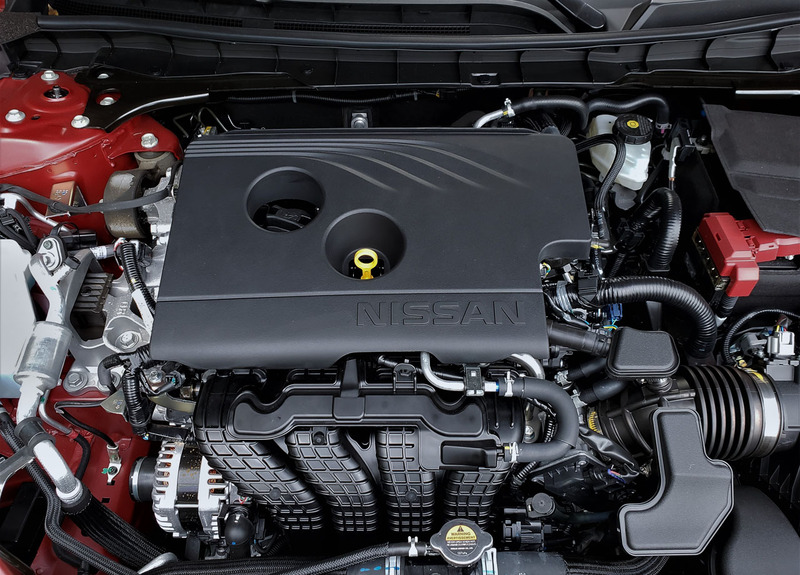 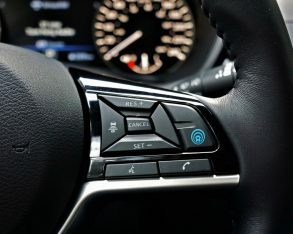 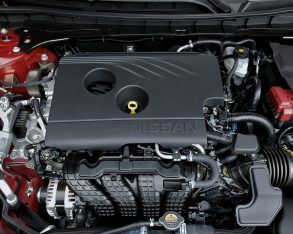 Driven modestly at legal city and highway speeds the Altima’s CVT is a perfect match for the equally modest powerplant, plus Nissan includes a Sport button on the backside of the shift lever for maximizing performance. 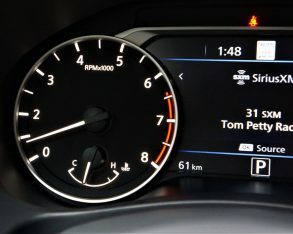 It allows revs to climb higher before a more assertive “gear change”, although with no manual mode available driver engagement is minimal. 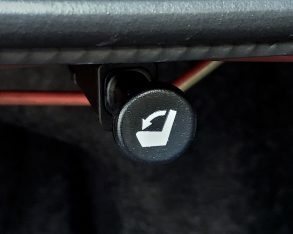 This brings up an important point. 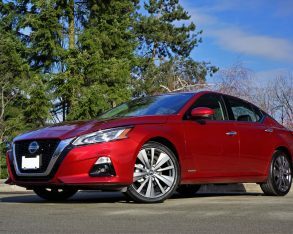 Nissan’s U.S. division offers the Altima with steering wheel paddle shifters and a sportier 2.0-litre variable-compression-ratio turbocharged four-cylinder engine good for up to 248 horsepower and 273 lb-ft of torque, but due to Nissan Canada’s insistence on standard AWD this FWD-only model won’t be heading north of the 49th. 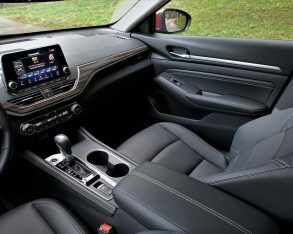 More importantly in this class, the new CVT features an expanded lock-up area for enhanced fuel economy, this helping the new Altima achieve a claimed 9.1 L/100km city, 6.5 highway and 7.9 combined in S and SV trims, or 9.3 city, 6.7 highway and 8.1 combined in Platinum or as-tested Edition One trims. 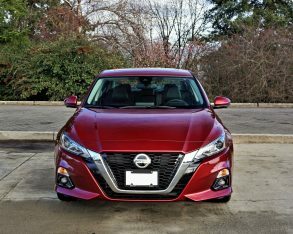 Unfortunately I had no time to head up one of Vancouver’s snowcapped local mountains to test out the all-wheel drive this time around, but the aforementioned system certainly gripped well in wet weather and there was no noticeable slip during takeoff. 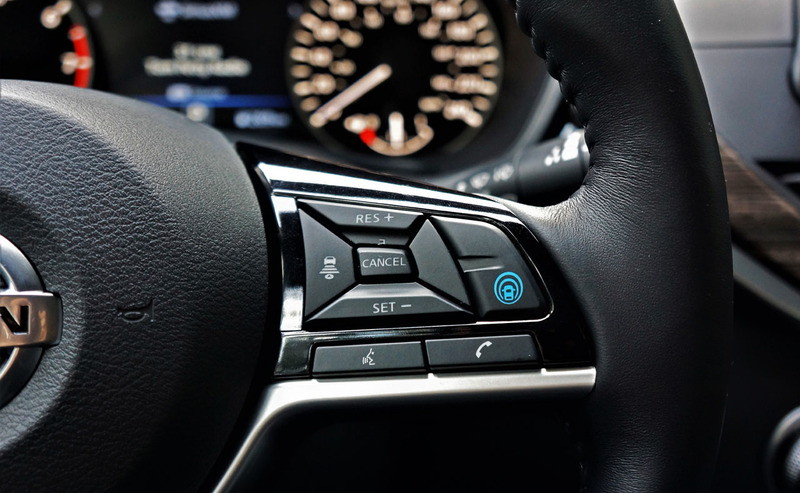 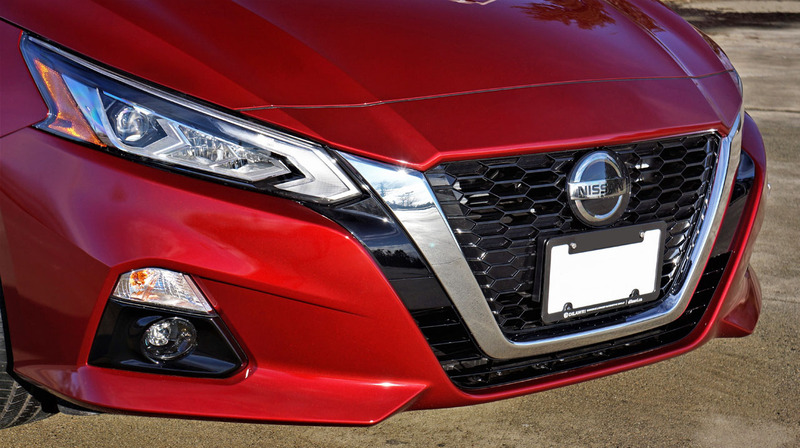 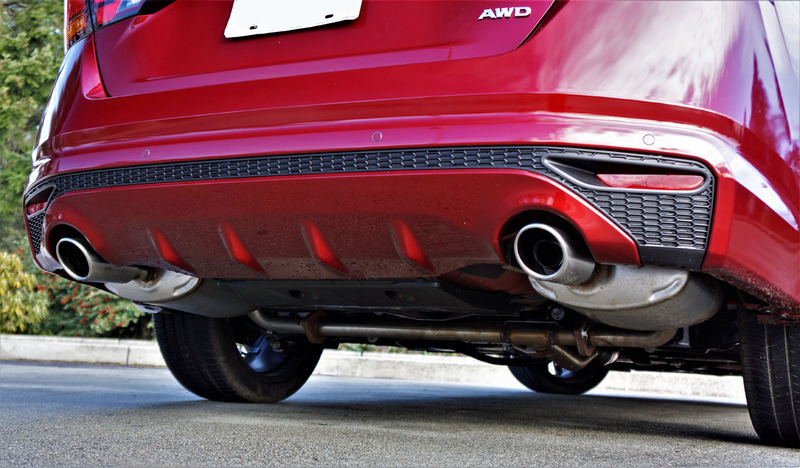 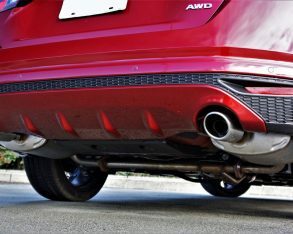 Adhesion was further aided by standard traction and stability control systems, while Active Understeer Control and Intelligent Trace Control enhanced the Altima’s admirable mechanical cornering capability, plus the car’s comfort quotient was improved upon via Intelligent Ride Control. 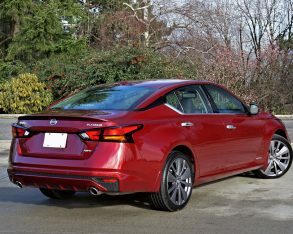 Balancing ride quality and handling has been an Altima strength for as long as I can remember, memories of which go back to the third-generation model’s Canadian launch program in 2001, and to this end the mid-size segment’s usual fully independent front strut and rear multi-link suspension setup takes care of comfort and control, with the expected stabilizer bars at each end and dual-pinion electric powered steering providing direction. 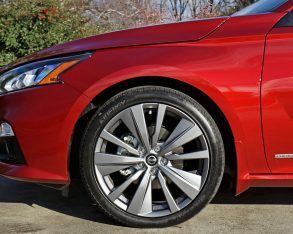 The combination works well, no doubt helped along via my tester’s aforementioned 19-inch alloys on 235/40 VR-rated all-season tires. 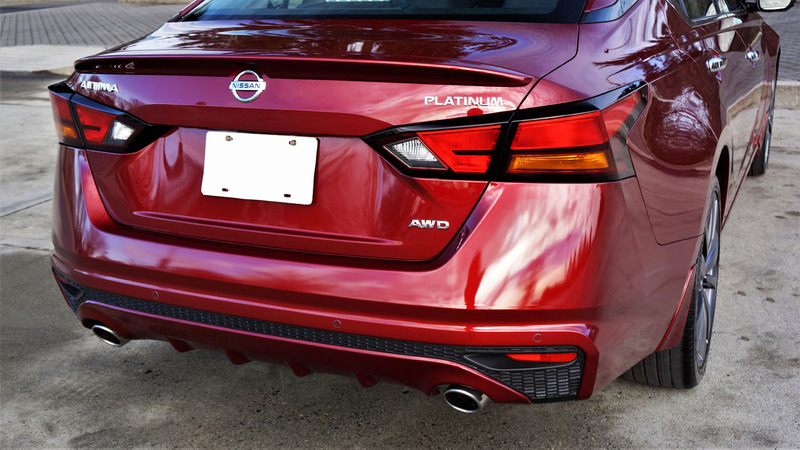 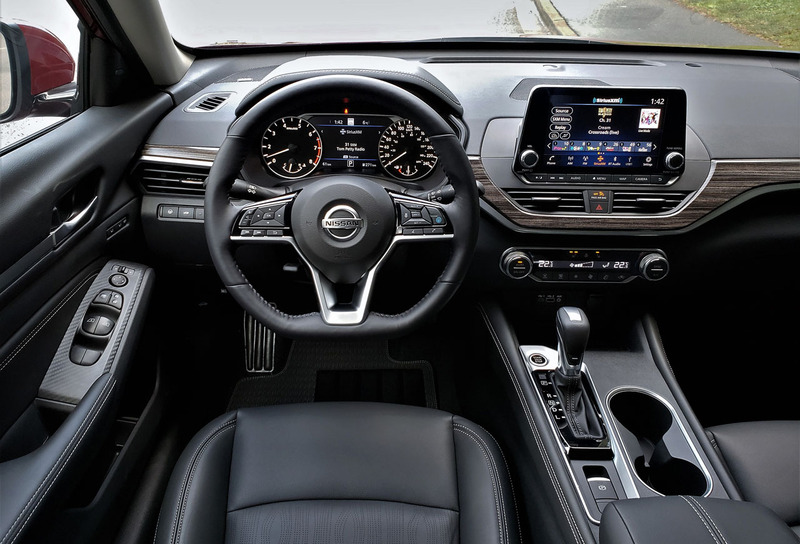 Features in mind, the 2019 Altima starts at just $27,998 plus freight and fees for base S trim, $31,498 for the SV, $34,998 for Platinum, and $35,998 for the 250-example limited-production launch version dubbed Edition One. 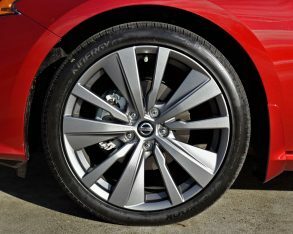 I’ll go into some of the standard and optional features available with other trims in a moment, but being that I’m actually covering this special model I should first mention that those just noted 19-inch alloys look really nice thanks to a matte grey finish and large chunky spokes. 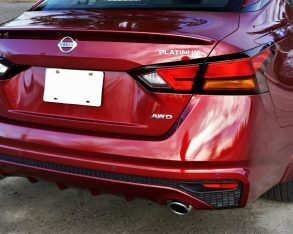 The Edition One also gets a larger than usual body-colour rear spoiler, “EDITION ONE” exterior badges on the lower portion of the front doors, ground lighting that emanates from below each side sill, illuminated “ALTIMA” metal kick plates, and really upscale grey carpeted floor mats with large “ALTIMA EDITION ONE” logos embroidered in a lighter silver/grey tone, along with the Platinum model’s standard feature set. 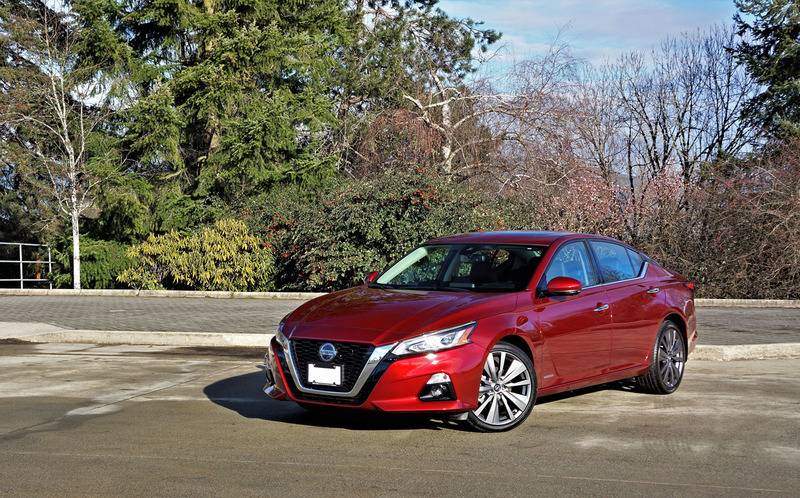 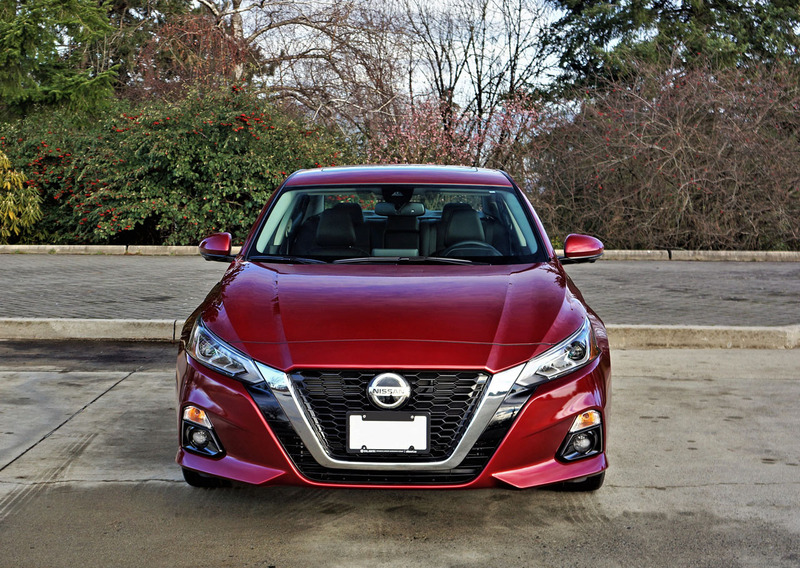 By the way, you can find out all 2019 Altima pricing details at CarCostCanada, including dealer invoice pricing and rebate info that could save you thousands. 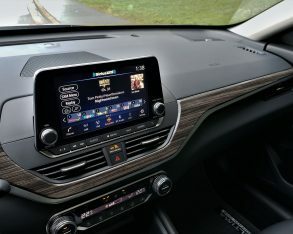 Those Platinum features pulled up to Edition One trim include interior accent lighting, wood-tone inlays on the instrument panel, leather upholstery, two-way driver’s memory, a four-way power-adjustable front passenger’s seat, an Intelligent Around View Monitor, navigation, voice recognition for navigation and audio, SiriusXM-powered NissanConnect Services featuring compatible smartphone and smartwatch access to functions like remote engine start/stop, remote door lock/unlock, valet alert, etcetera, Door to Door Navigation that provides seamless transfer from a personal device using NissanConnect to the car’s infotainment interface, Premium Traffic that improves ETA accuracy, SiriusXM Traffic and Travel Link, nine-speaker Bose premium audio, and Traffic Sign Recognition. 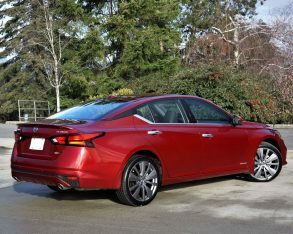 Advanced driver assistance in mind, the new Altima not only comes standard with Intelligent Emergency Braking, but it also features standard Intelligent Forward Collision Warning (I-FCW), Intelligent Driver Alertness (I-DA), and Rear Door Alert that reminds you of anything/anybody left in the back seat when exiting your car, while additional base S trim features pulled up to our top-line Altima include the aforementioned automatic Xtronic CVT and AWD, plus remote engine start, proximity-sensing keyless access, pushbutton ignition, an electromechanical parking brake, auto on/off headlights, LED turn signals within the side mirror housings, LED taillights, active grille shutters, a UV-reducing solar glass windshield, an Advanced Drive-Assist display within the otherwise analogue Fine Vision electroluminescent gauge cluster, an 8.0-inch infotainment touchscreen with Apple CarPlay, Android Auto, a backup camera, Bluetooth hands-free smartphone connectivity with streaming audio, hands-free text messaging, Siri Eyes Free voice recognition, two illuminated USB ports and two of the smaller USB-C ports, plus more, while the standard menu continues with micro-filtered air conditioning, heated front seats, an eight-way powered driver’s seat, etcetera. 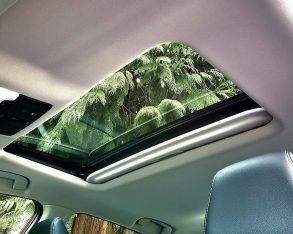 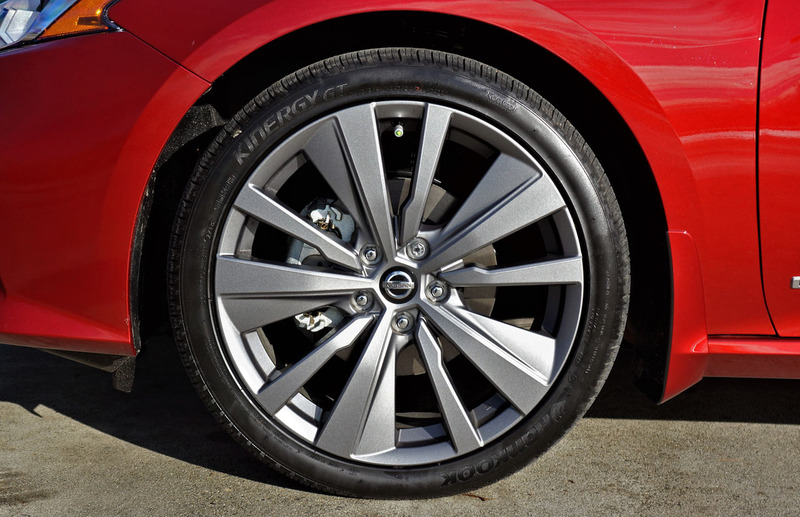 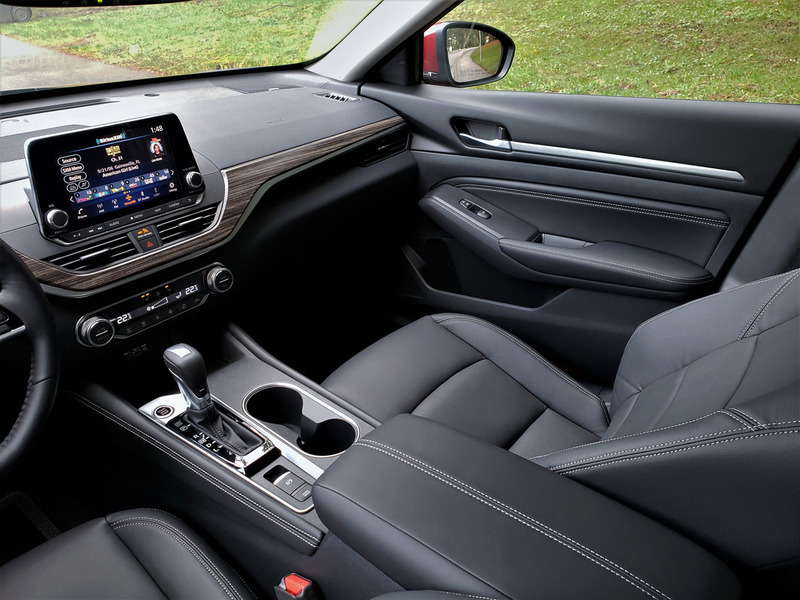 When climbing inside I was first impressed with the Altima’s clean, contemporary design and better use of higher quality premium materials when compared to the outgoing Altima. 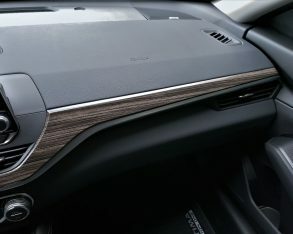 When seated up front, most surfaces above the waistline are made from soft-touch synthetic, the dash and instrument panel particularly attractive in their minimalist design, albeit the woodgrain used for the latter feels a lot more genuine than it looks. 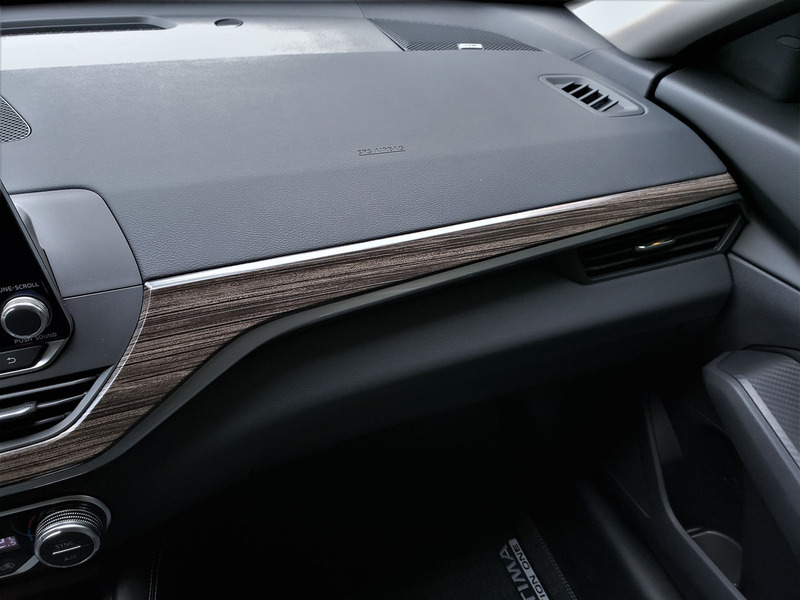 Fortunately there’s no wood on the door panels, only extensions of the tasteful satin-silver accents used for the instrument panel and centre console, plus some French-stitched leatherette over soft padding found on the inserts and armrests. 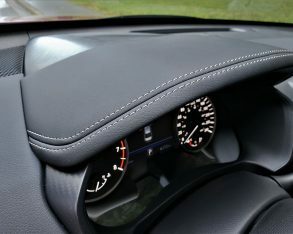 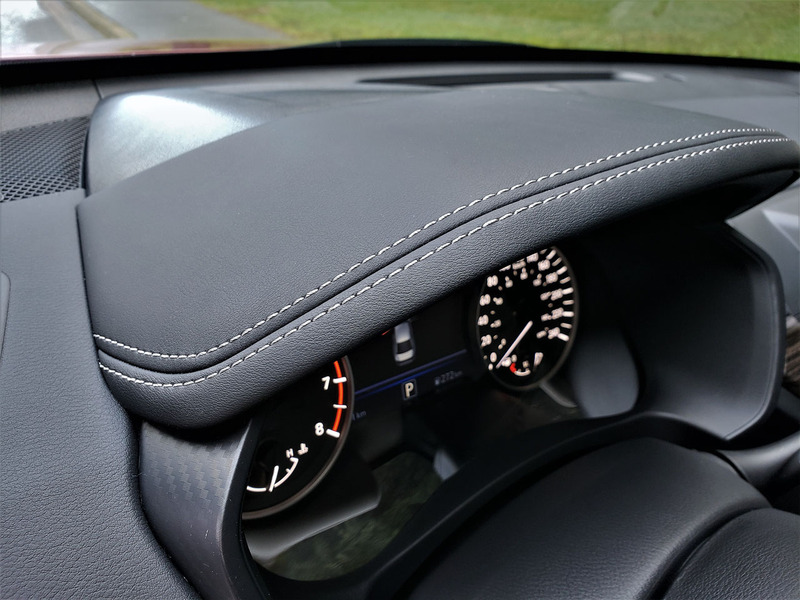 Nissan uses this treatment for the primary instrument hood too, not to mention down each side of the lower console, providing a premium treatment that’s not unlike its larger, fancier Maxima sedan. 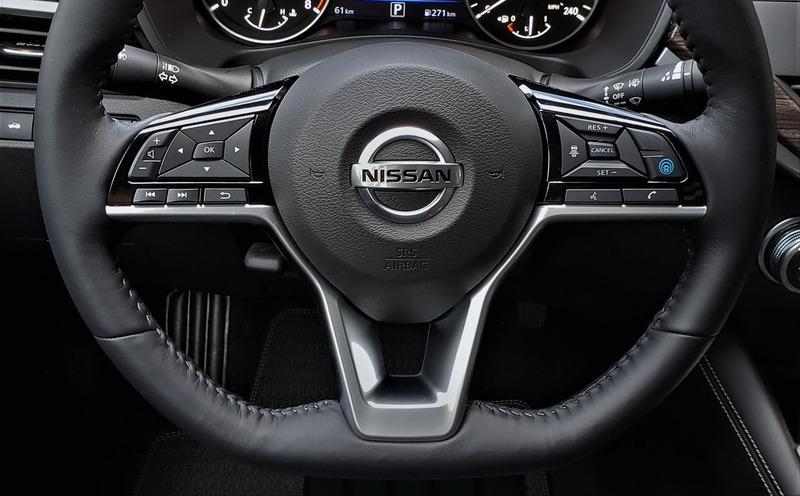 A personal favourite item is the thick leather-wrapped steering wheel rim that gets a slightly flattened bottom section for a sporty look and feel. 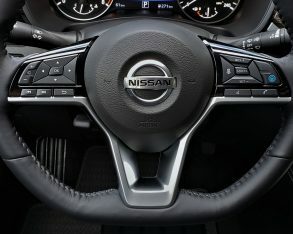 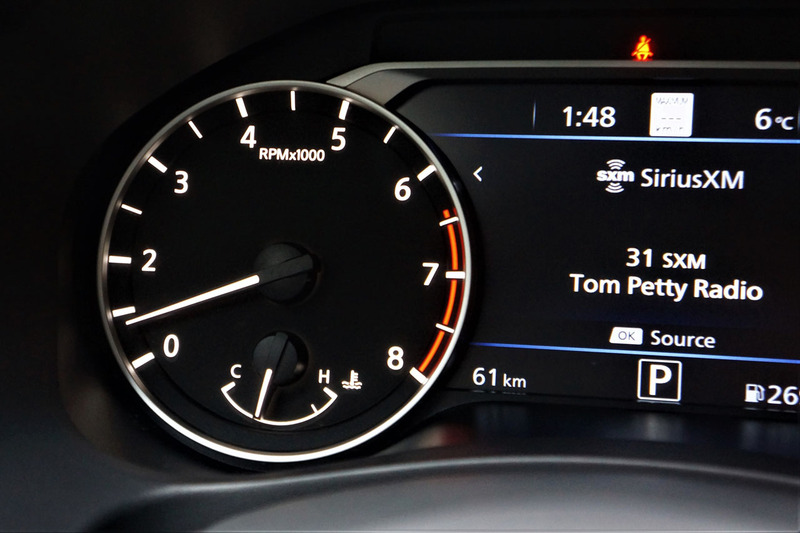 It’s enhanced with Nissan’s usual high-quality switchgear, while the aforementioned instrument cluster is bright, clear and filled with a large colour TFT multi-information display at centre. 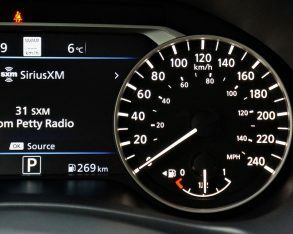 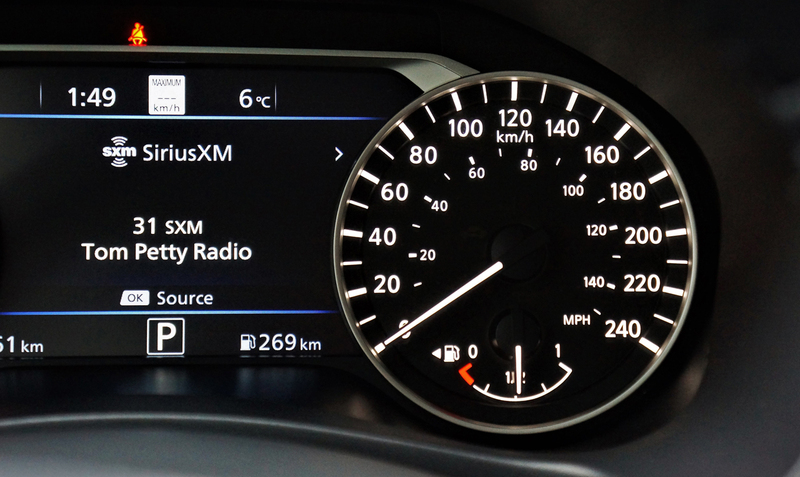 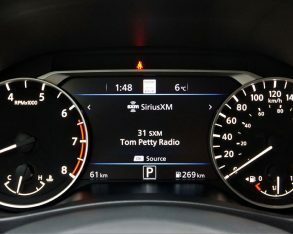 This said it’s up against a couple of rivals that feature fully digital gauges in top trims, but I doubt this will be a deal-breaker for the majority of mid-size sedan buyers. 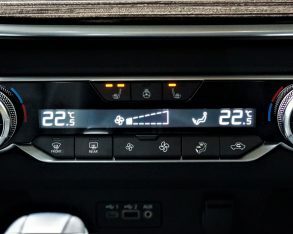 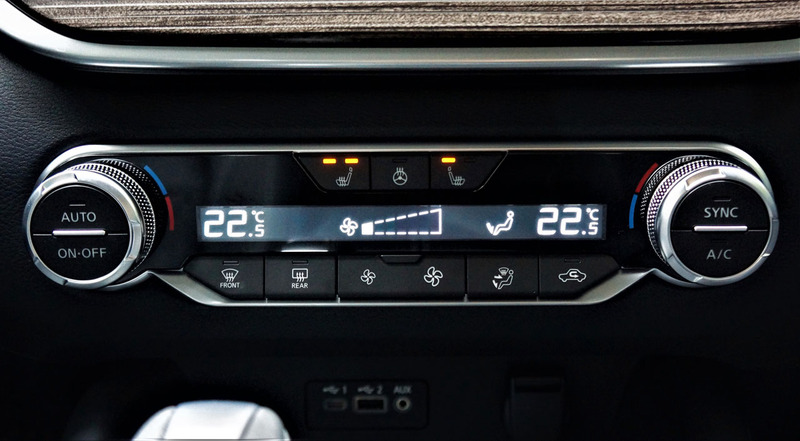 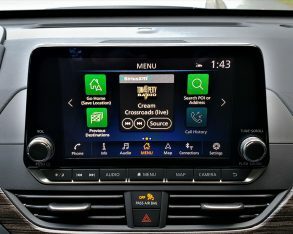 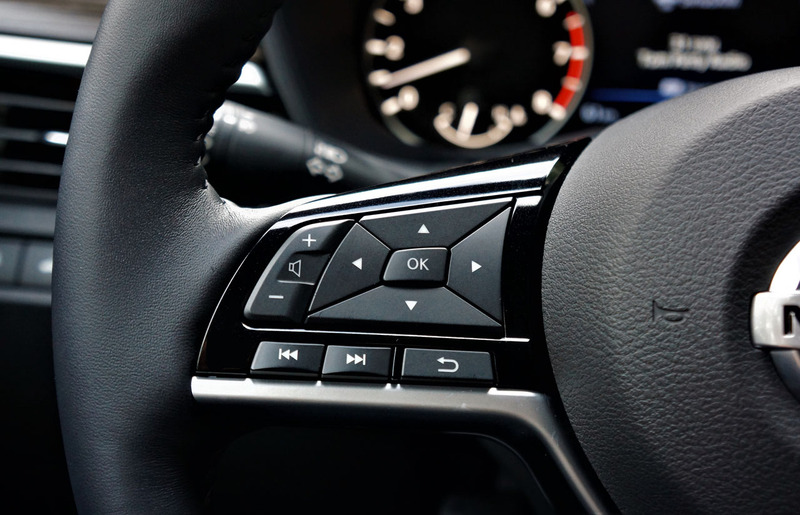 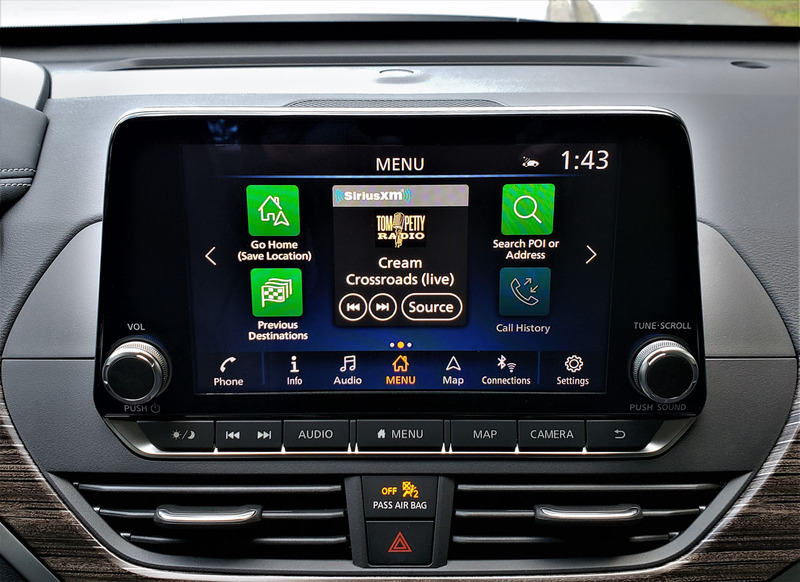 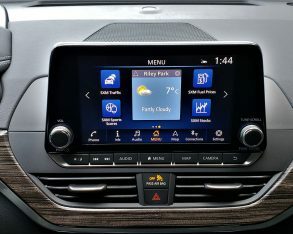 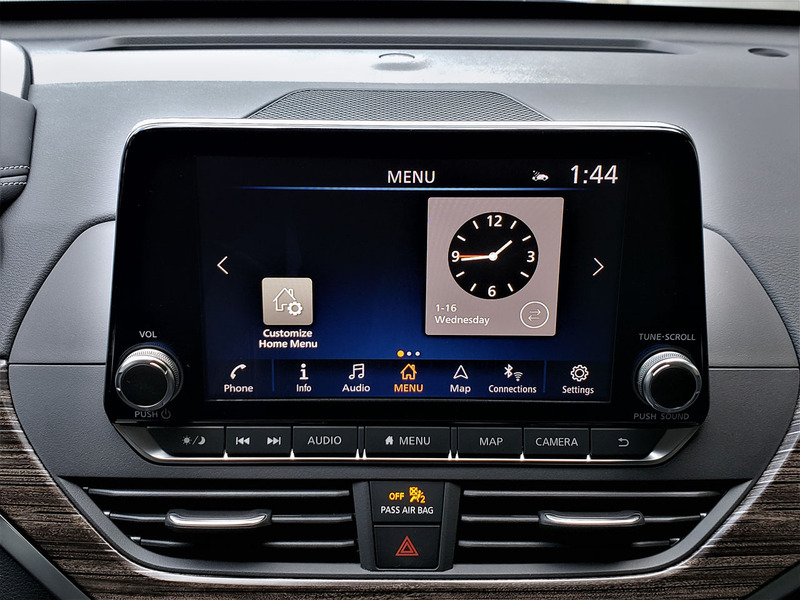 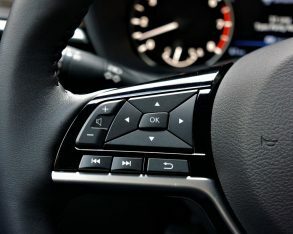 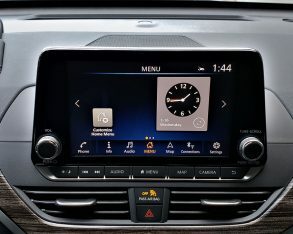 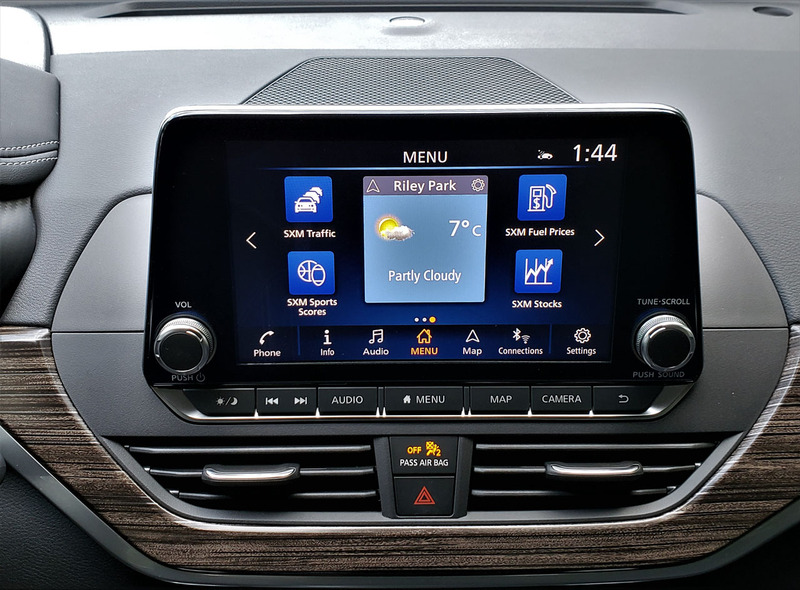 The infotainment touchscreen sits high atop the centre stack in the usual fixed tablet design, and as tested comes crammed with all the top-tier features mentioned earlier. 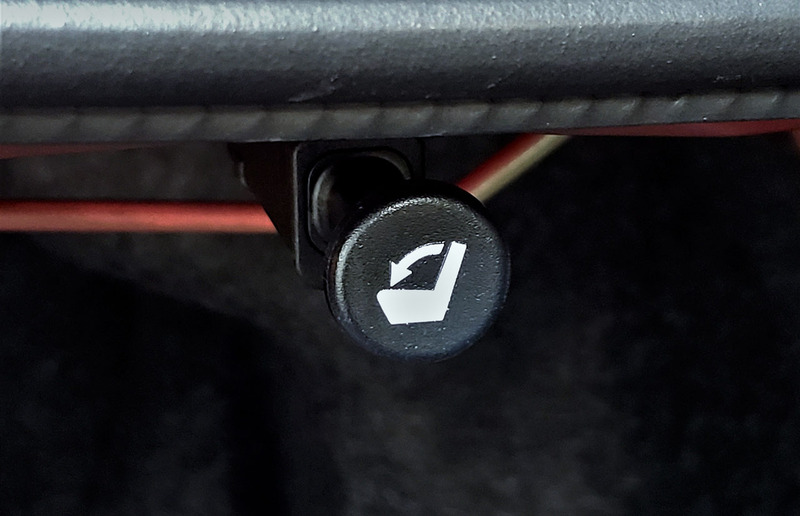 Along with the usual tap gesture control, you can pinch and swipe its surface in certain applications, such as the navigation system’s map, but I must say I wasn’t certain of this at first try because it took so long for the system to respond. 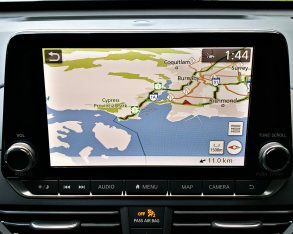 Some of its dulled reaction seemed to be due to having just started up the car, but even when it allowed me to zoom in and out or move the map around it wasn’t as immediately engaging or as smooth as some other systems in the class. 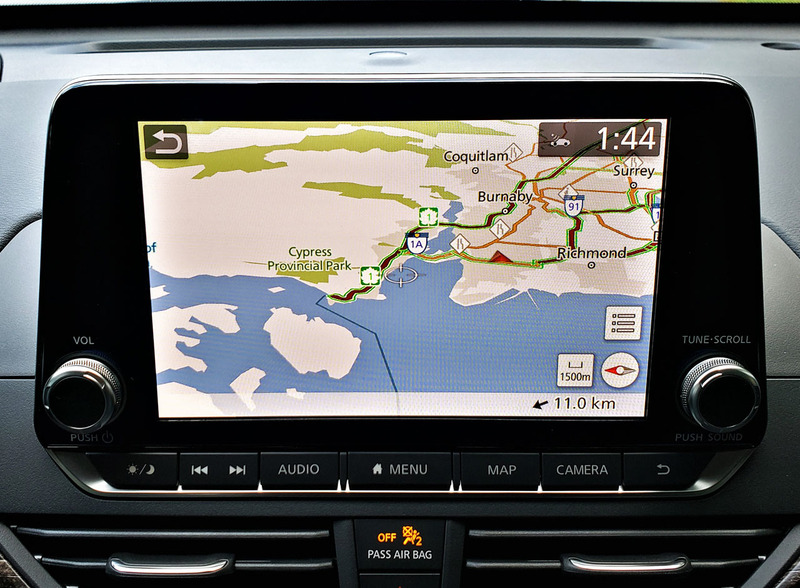 The map graphics are very nice, however, and its route guidance worked flawlessly, while the infotainment system’s interface is well thought out on the whole. 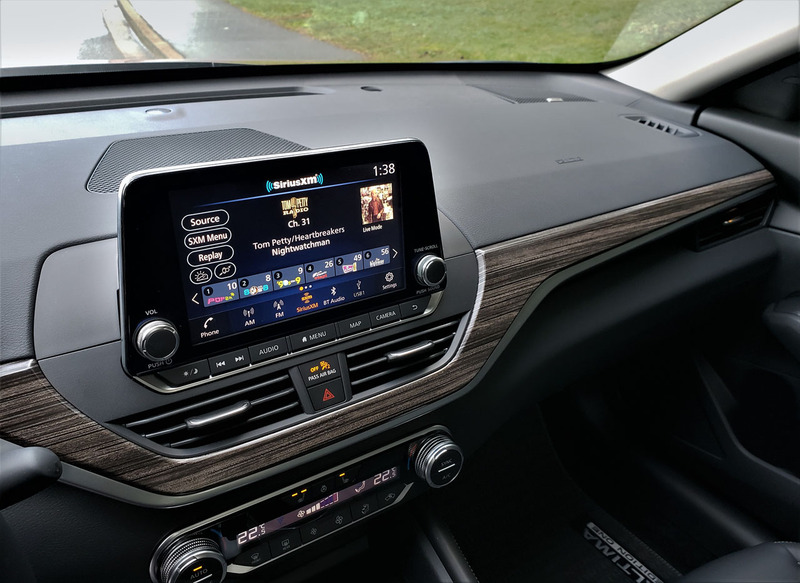 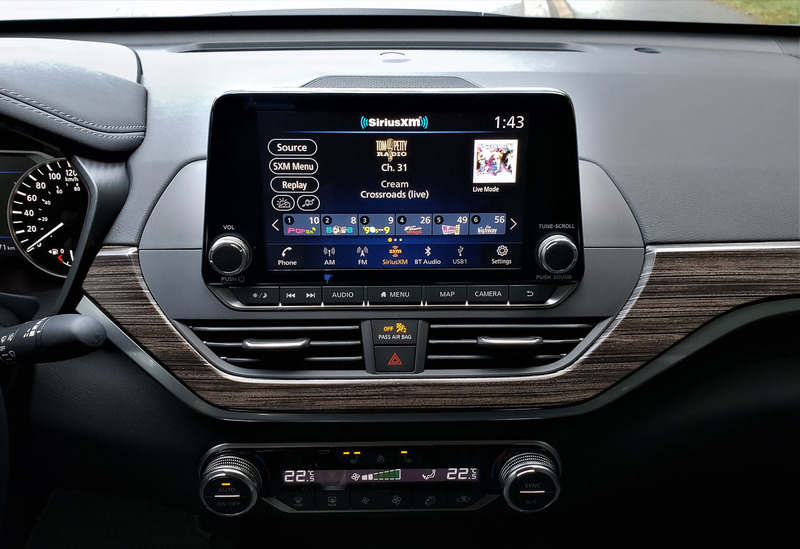 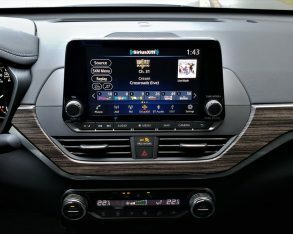 Likewise, the clarity of the display is excellent, as is its depth of colour and contrast, this made especially noticeable in the audio system’s satellite radio panel that provides colourful station branding and album cover artwork, while the Bose system’s sound quality was very good. 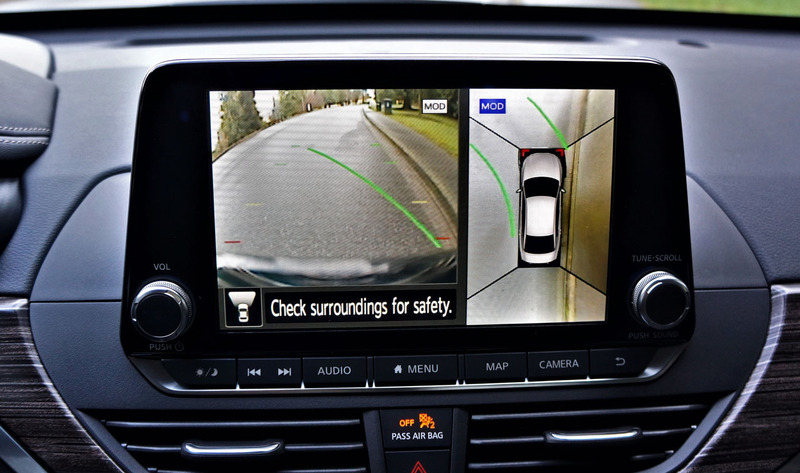 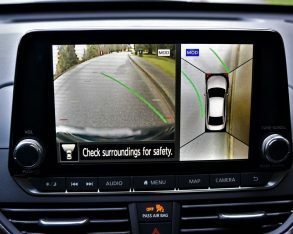 Also impressive, my tester’s parking monitor was a split-screen design with a regular reverse camera featuring active guidelines to the left and an overhead 360-degree surround camera system to the right, a best of both worlds scenario. 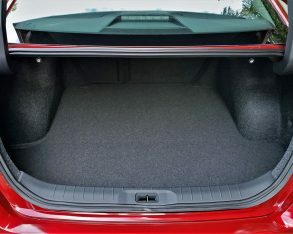 This, combined with the previously noted rear sensors, made parking very easy. 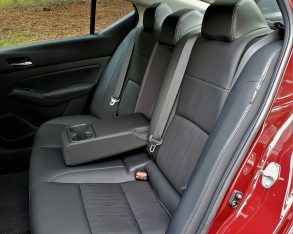 Also positive, the Altima’s “Zero Gravity” seats are wonderfully comfortable, with good lower back support plus the addition of two-way driver’s lumbar support that fit the small of my back almost perfectly. 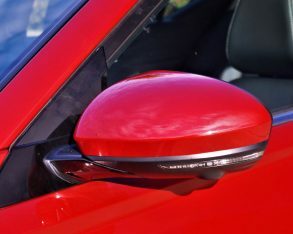 What’s more, I was pleased with the amount of rake and reach found in the tilt and telescopic steering column, allowing me to set up the driving position ideally, which isn’t the case with some rivals. 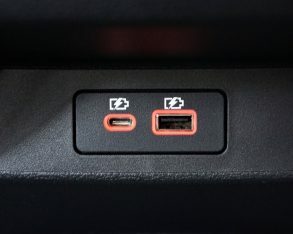 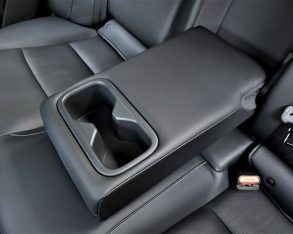 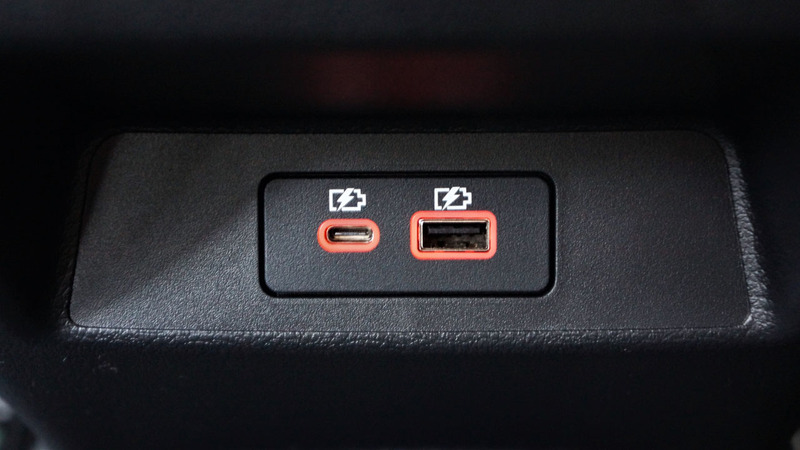 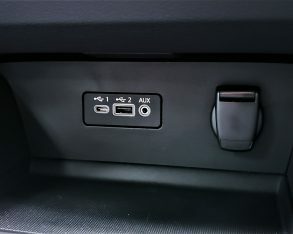 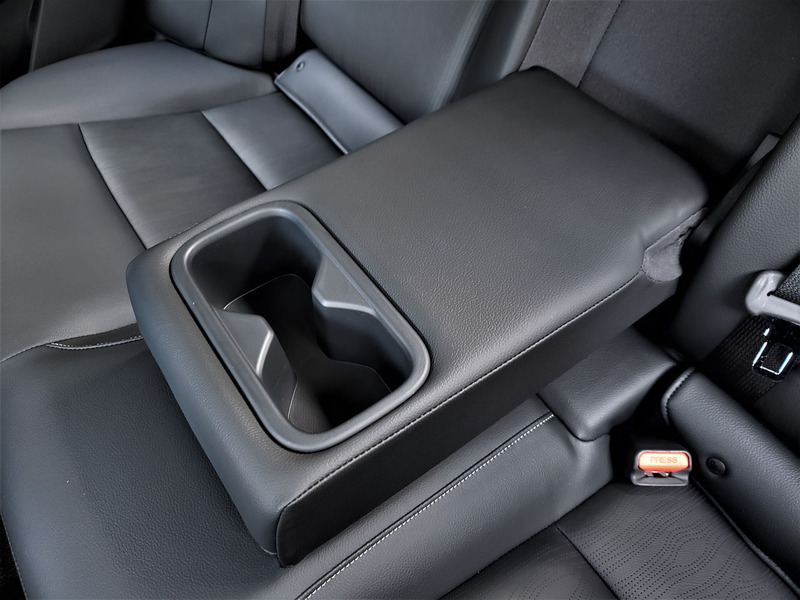 An armrest with cupholders folds down at centre, while additional rear seat amenities include reading lights overhead and, as noted earlier, two sizes of USB ports on the backside of the front centre console. 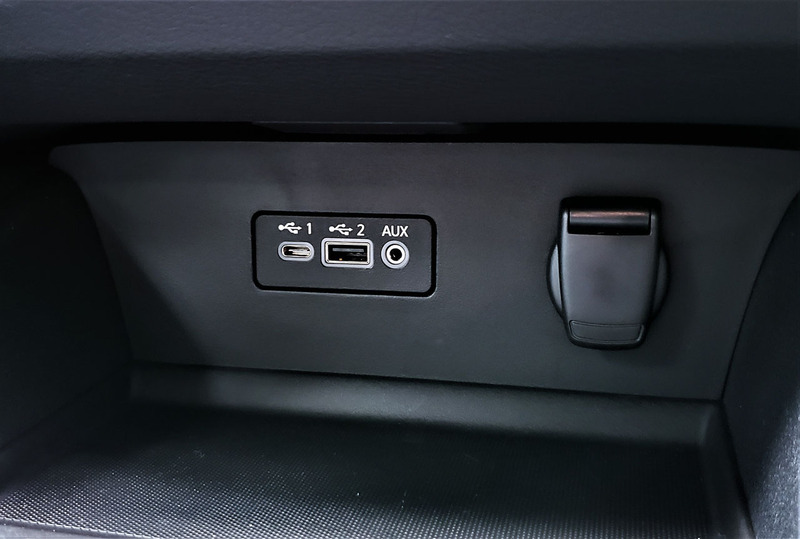 Other than a set of air vents on that same console, that’s about it for niceties in back, which means that fans of rear seat heaters need not apply. 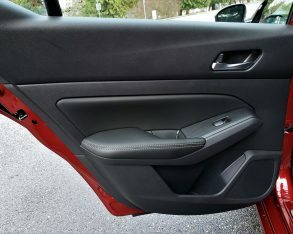 I was also surprised to find hard plastic rear door uppers, not to mention the same hard plastic used for most of the mid and lower door panels. 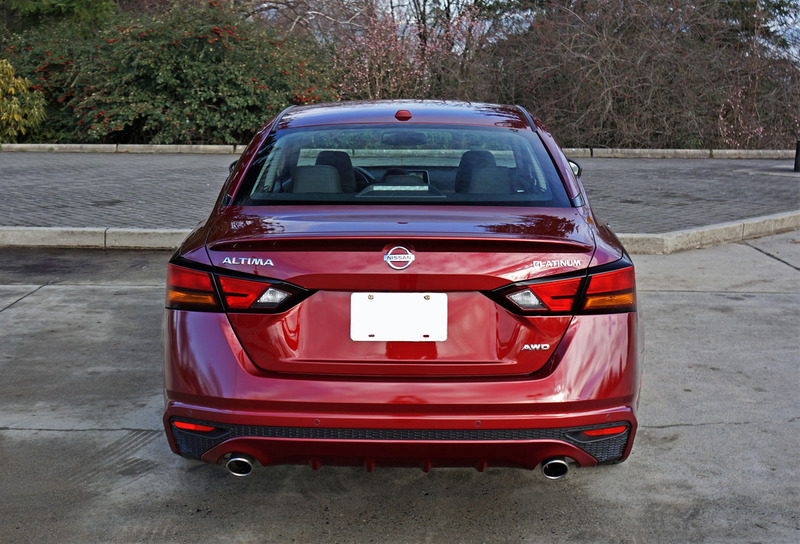 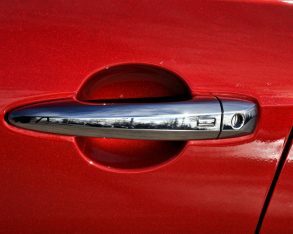 Not only is this rare for the mid-size sedan segment no matter the trim level, but the outgoing Altima featured soft-touch door uppers in back. 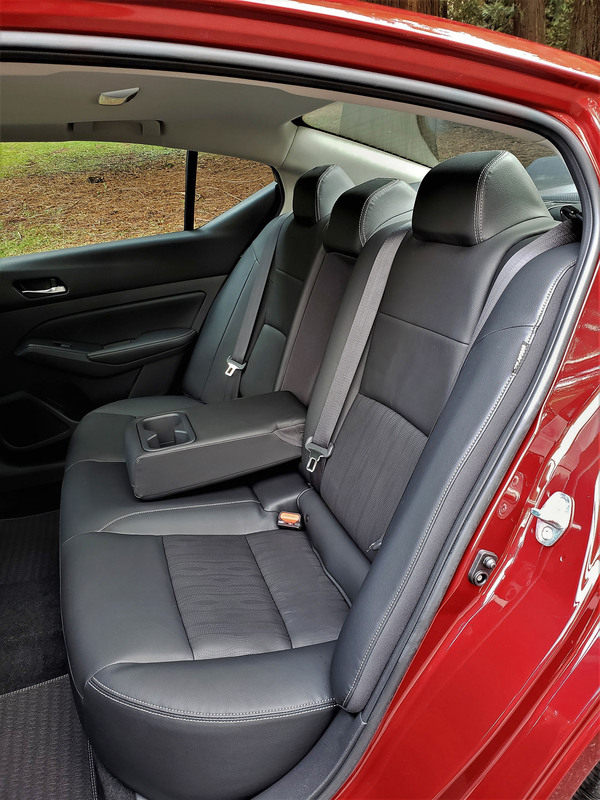 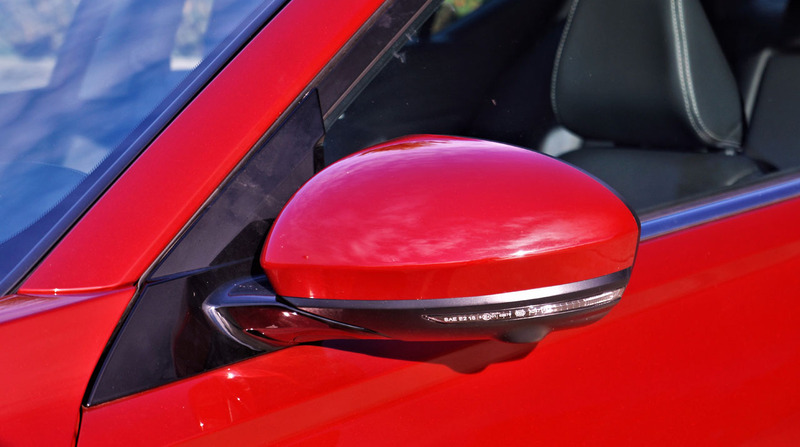 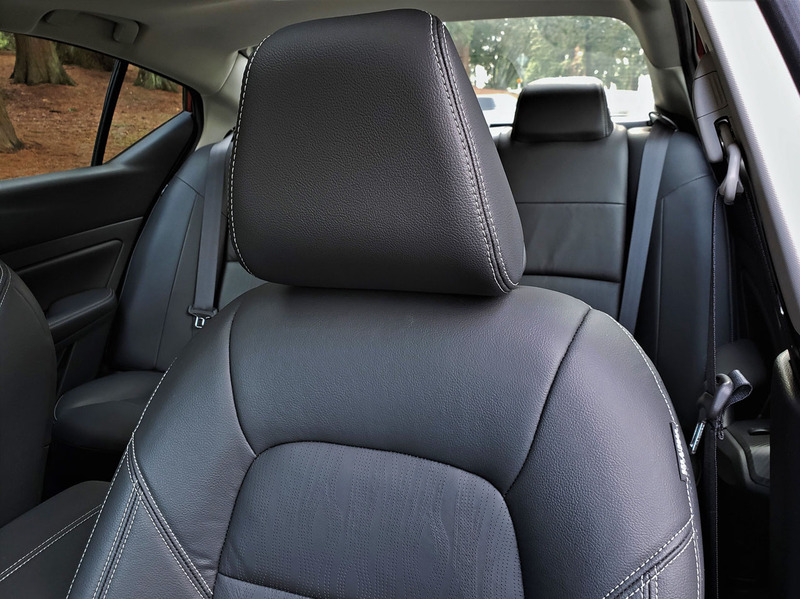 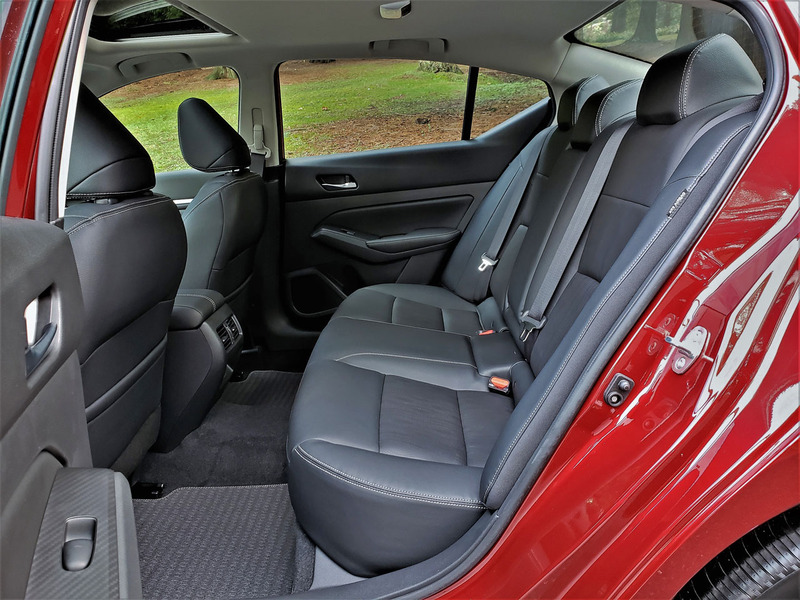 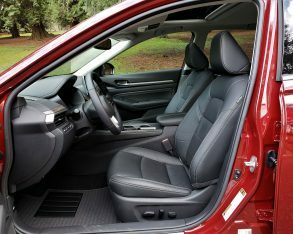 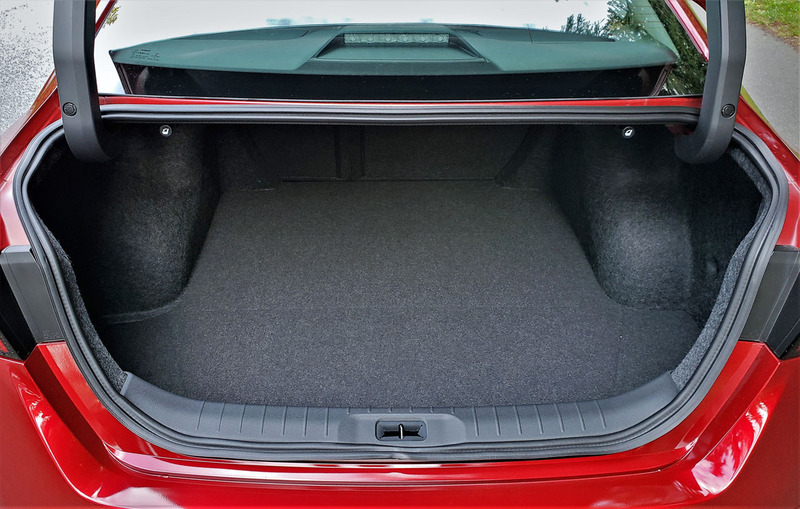 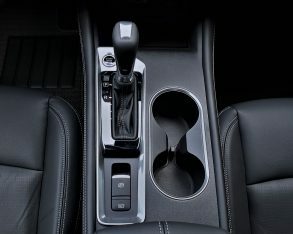 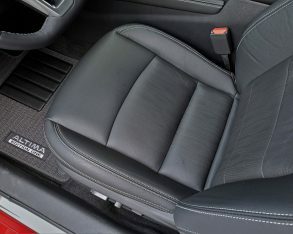 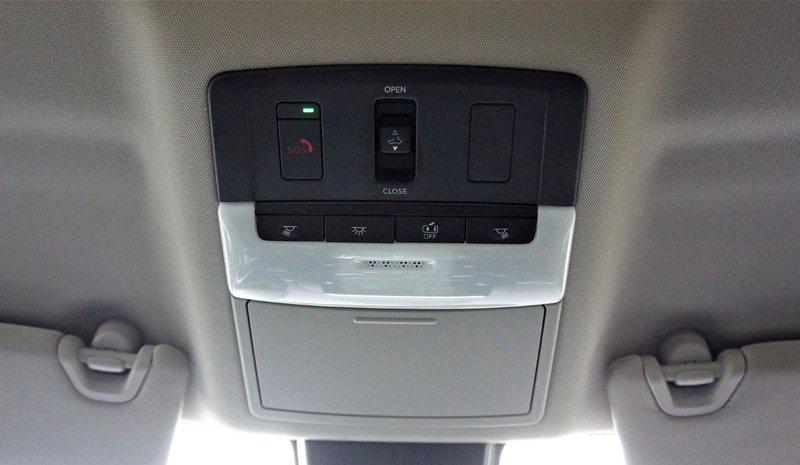 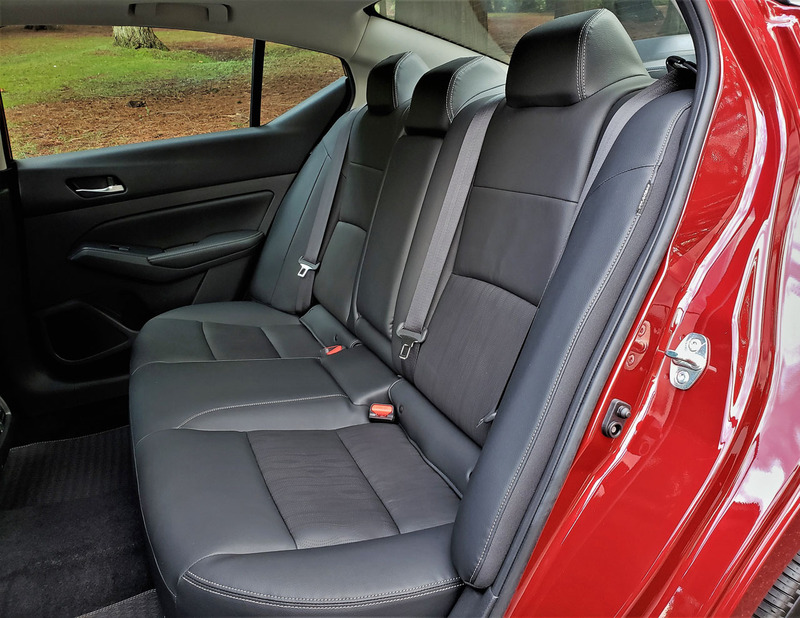 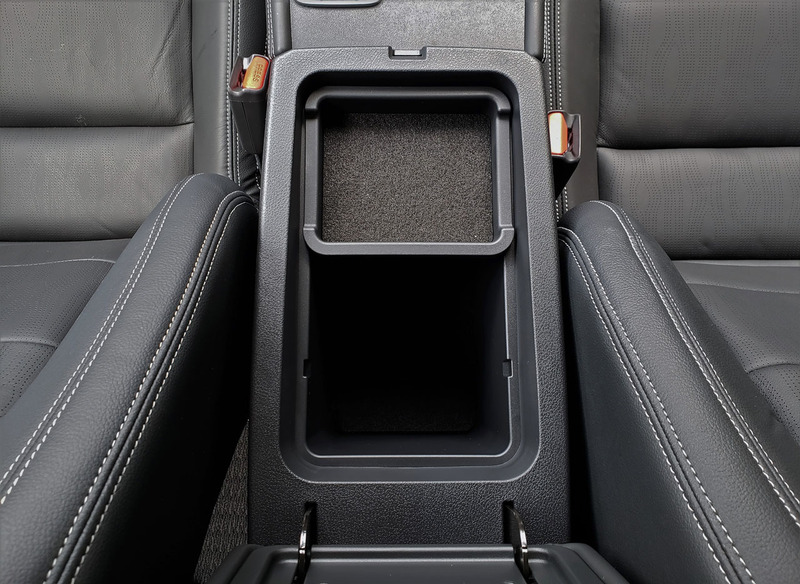 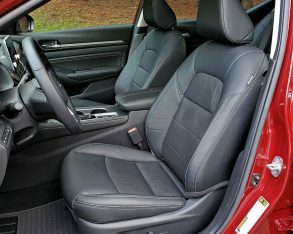 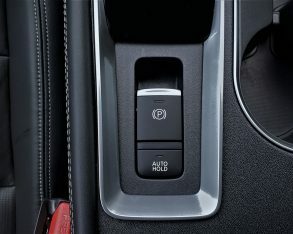 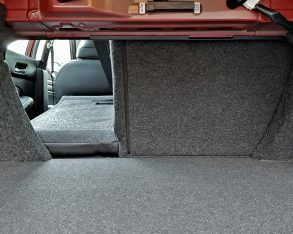 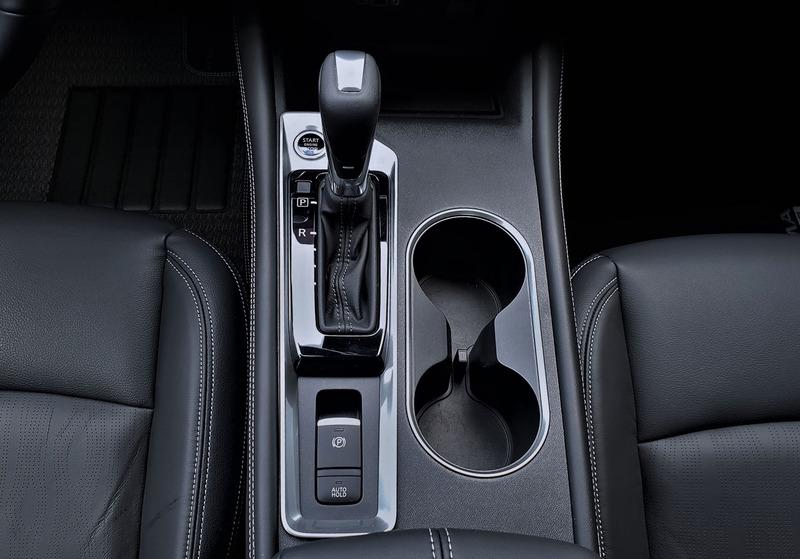 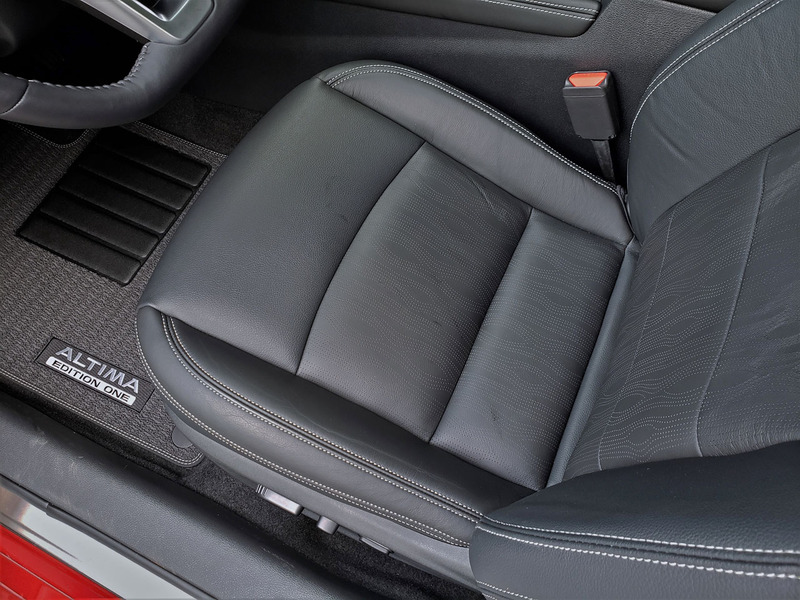 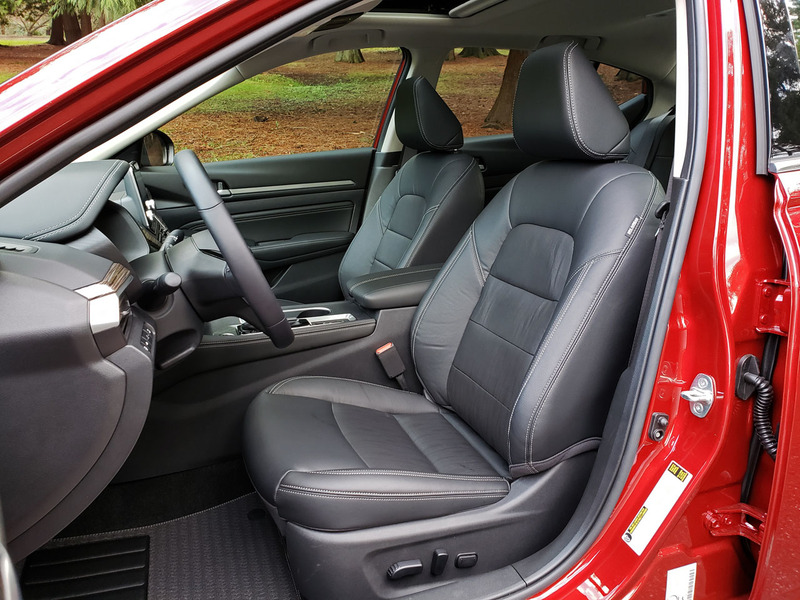 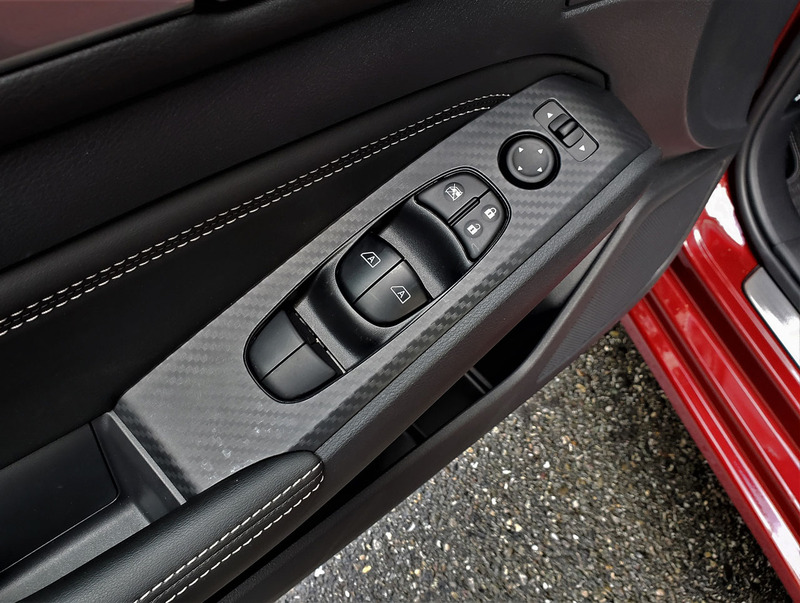 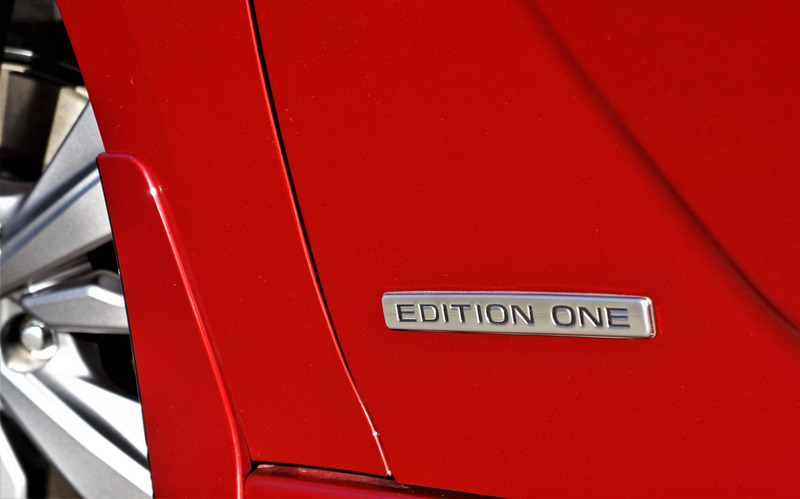 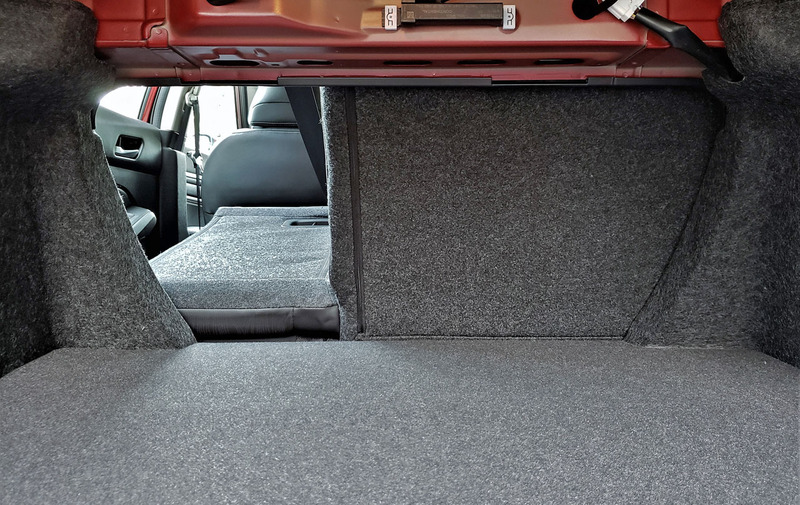 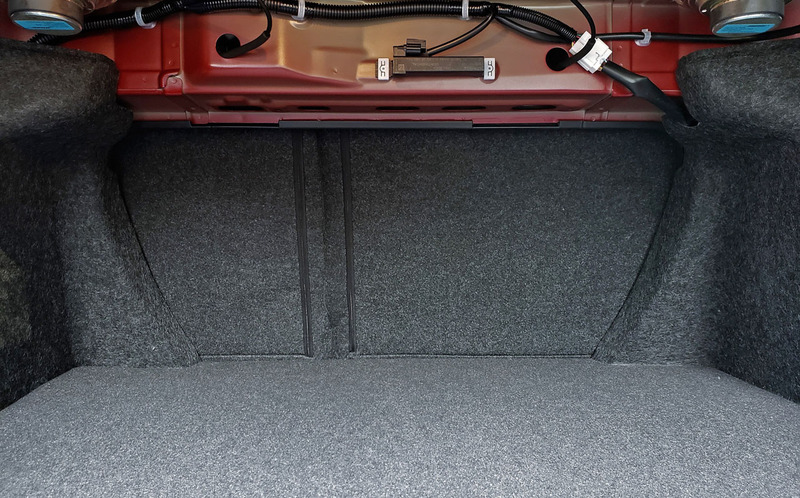 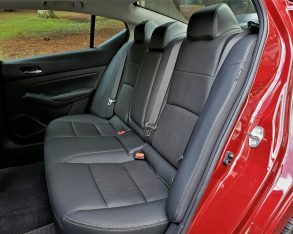 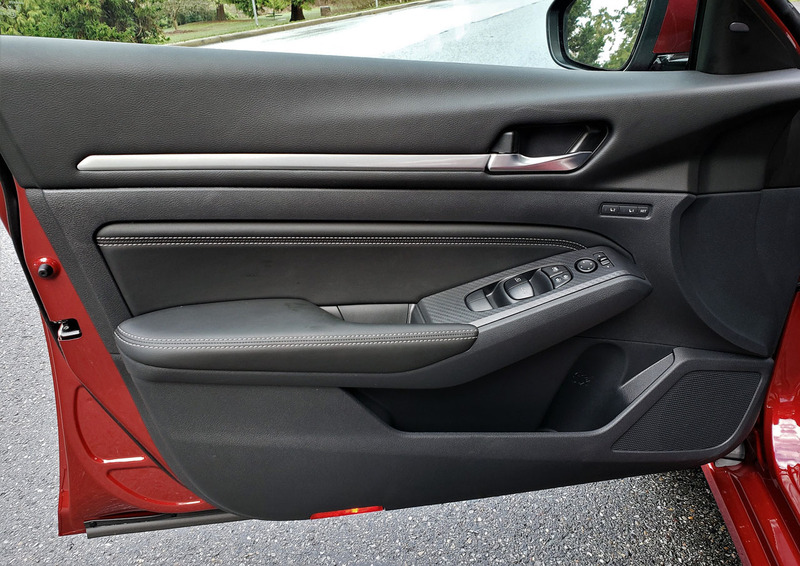 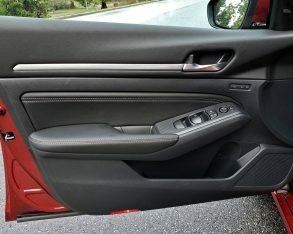 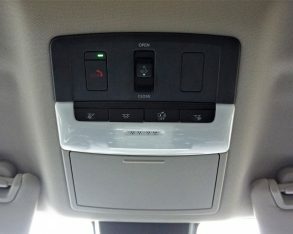 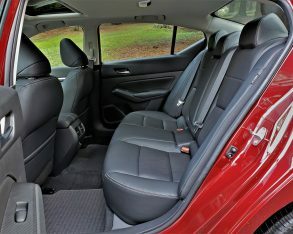 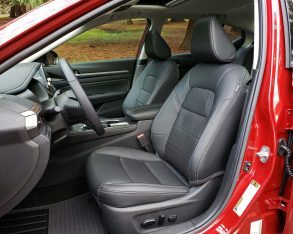 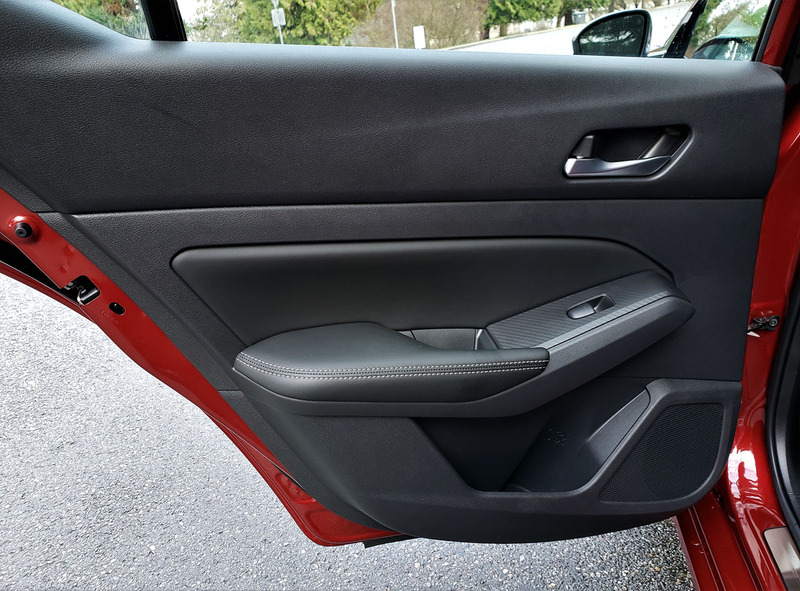 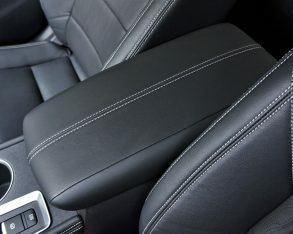 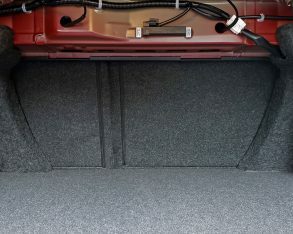 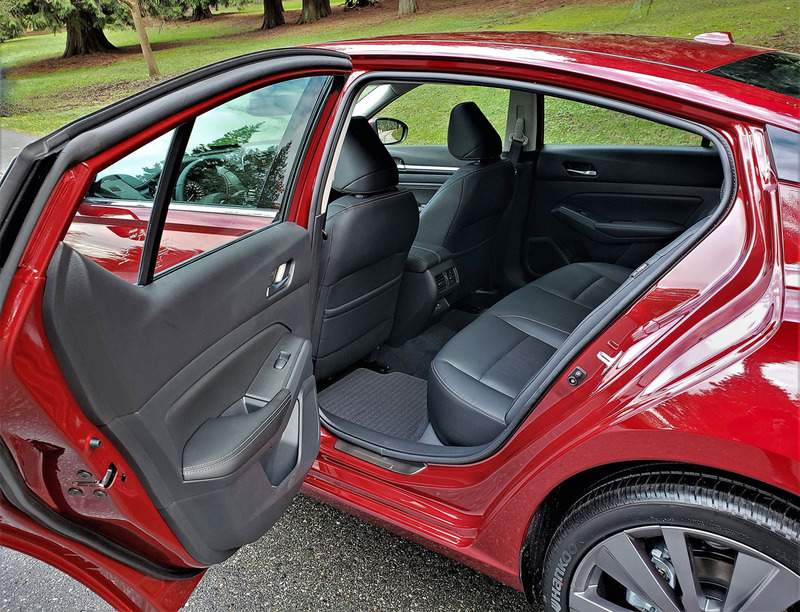 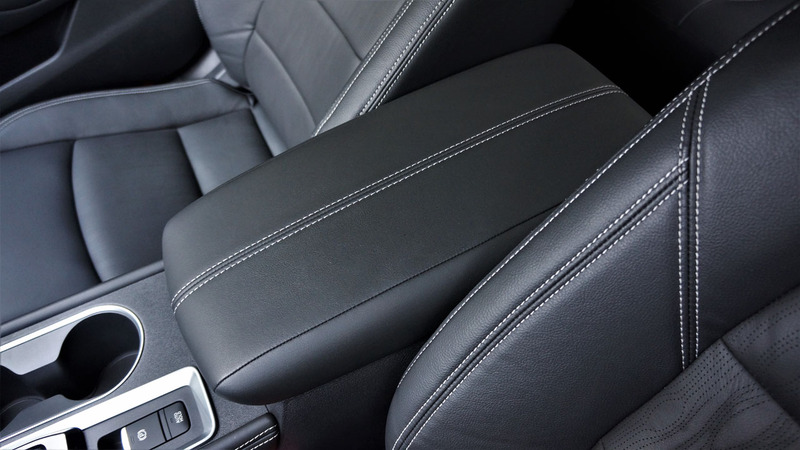 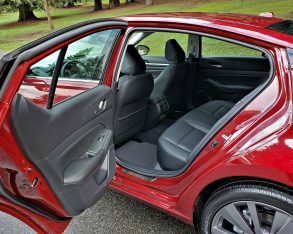 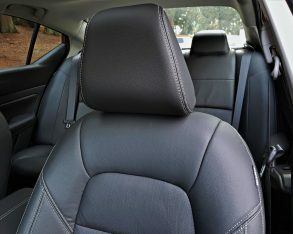 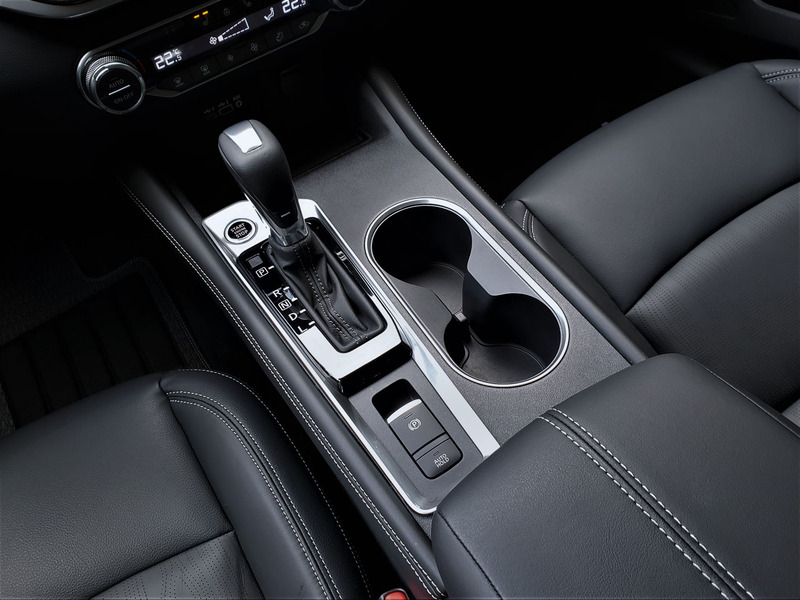 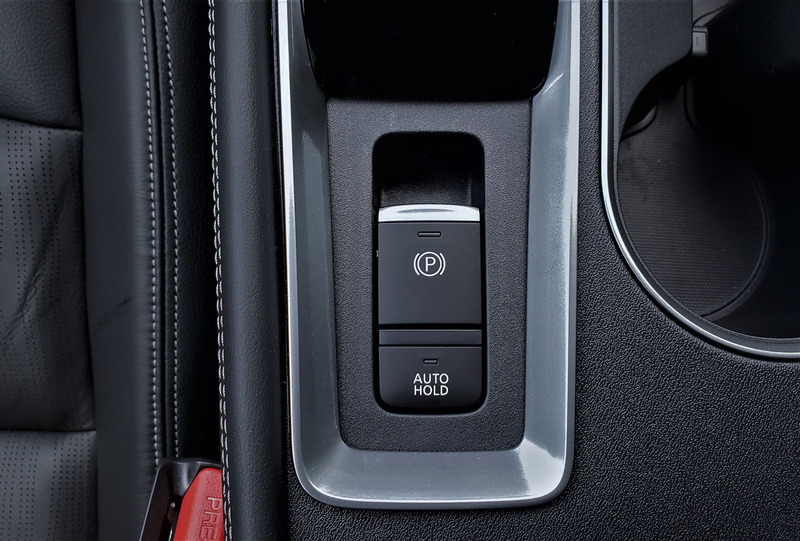 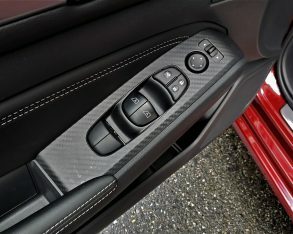 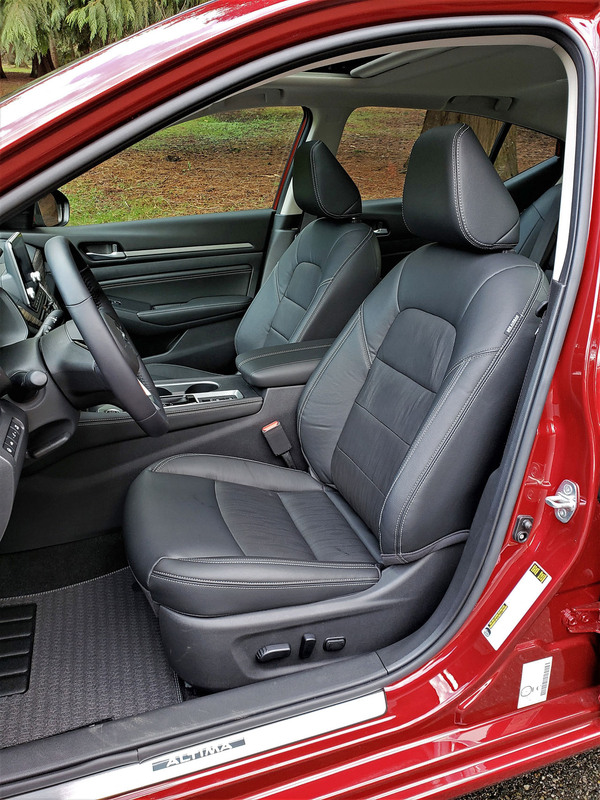 Only a small portion of this 2019 model’s door insert comes fitted with padded leatherette, along with the armrest, which results in a lower level of rear seat luxury than most in this segment. 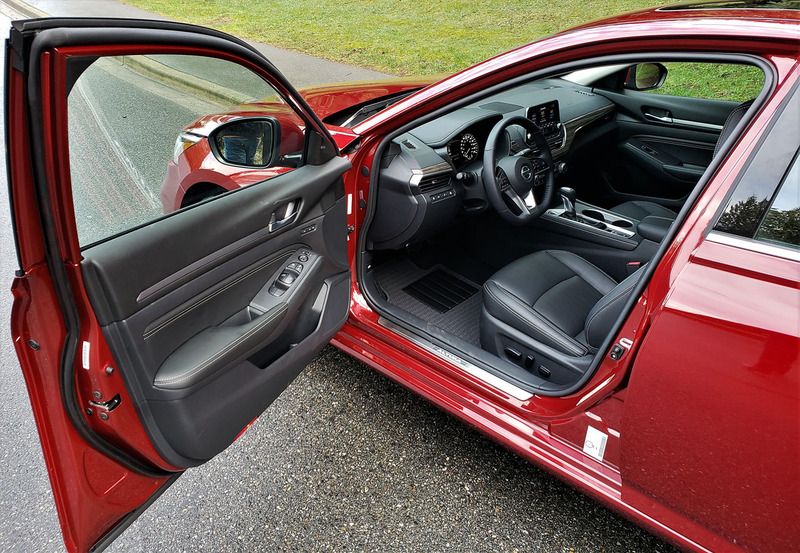 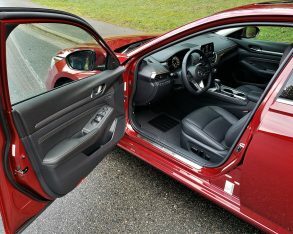 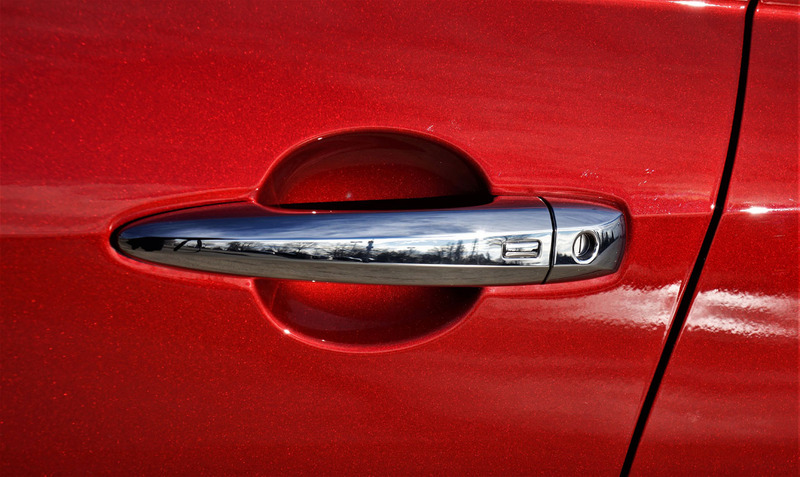 In fact, even this full-load Altima Edition One’s rear doors are no nicer than what you’d find in an entry-level compact car, and therefore they’re disappointing. 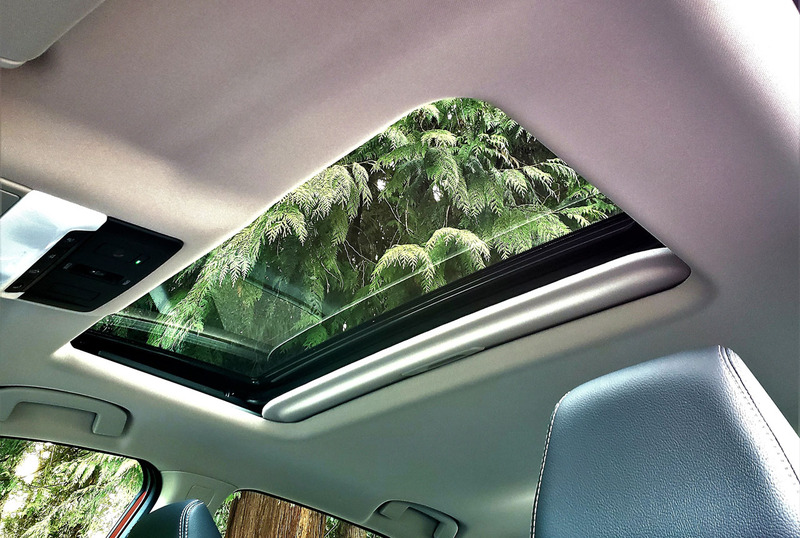 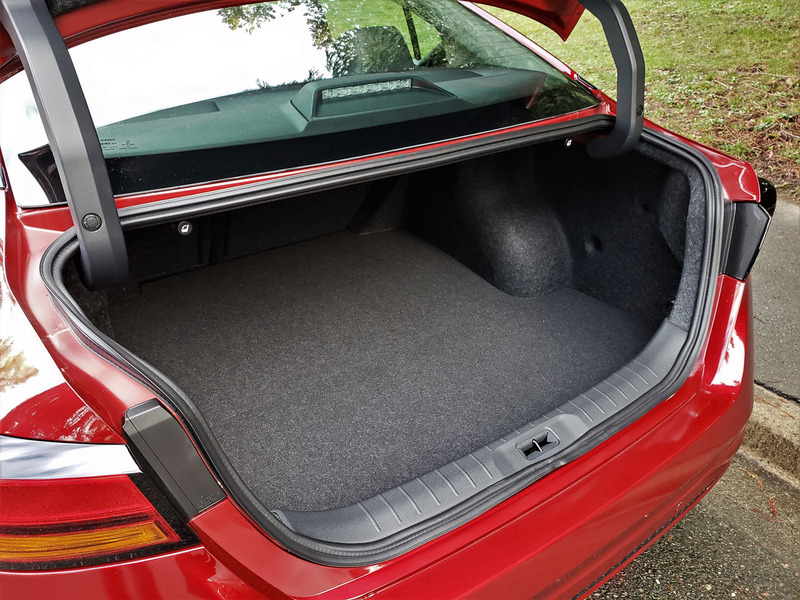 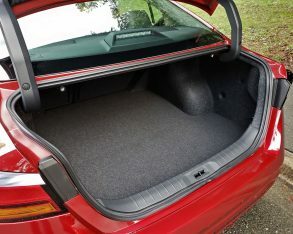 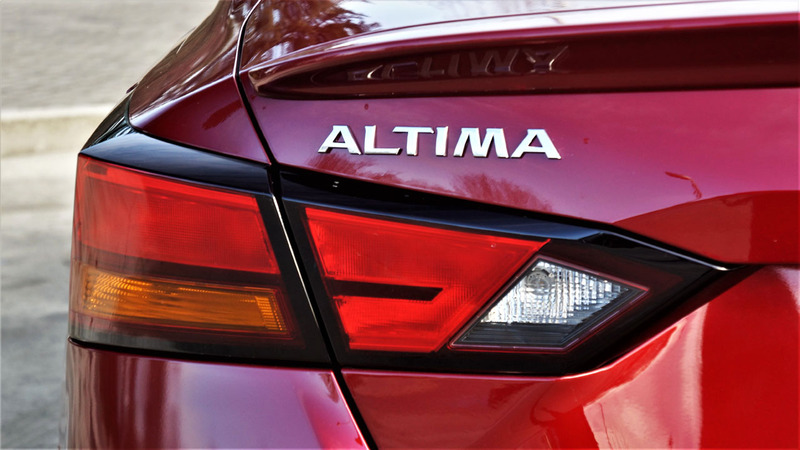 Moving farther back still, some might be put off by the new Altima’s lack of trunk space. 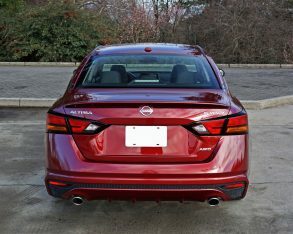 At 436 litres (15.4 cubic feet) it’s larger than most compacts, but it’s smaller than the Camry, Accord and others it’s up against. Release pulls allow 60/40-split rear seatbacks to tumble forward when more space is needed for transporting longer cargo, but this is par for the course in this class. 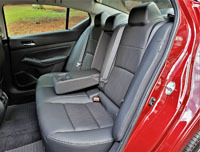 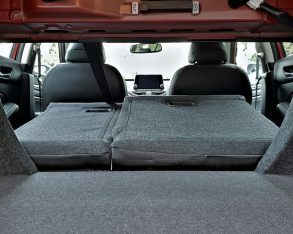 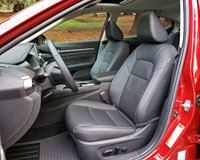 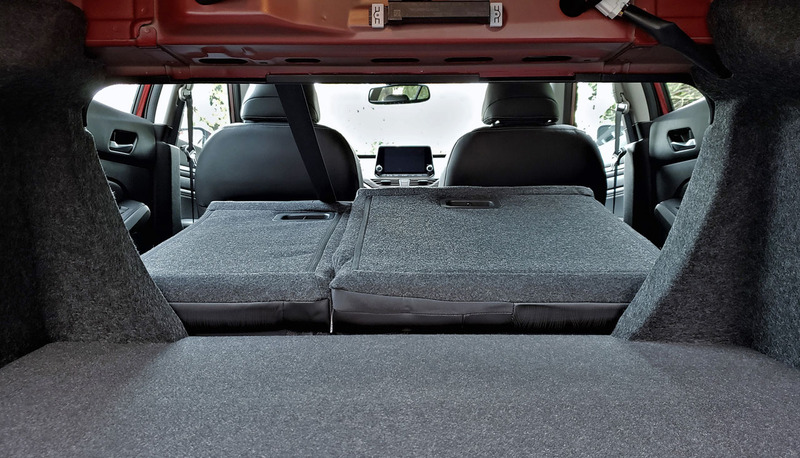 Unusually good, however, is a front passenger’s seatback that can be fully reclined to house extra-long cargo. 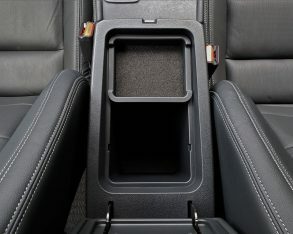 Speaking of space up front, I could have used more cubbies on or under the centre console, and the glove box isn’t as cavernous as the outgoing model’s, but kudos to Nissan for correcting a constant complaint of mine, the overhead sunglasses holder now fits all types of shades thanks to the removal of a nosepiece holder that was previously ridiculously oversized. 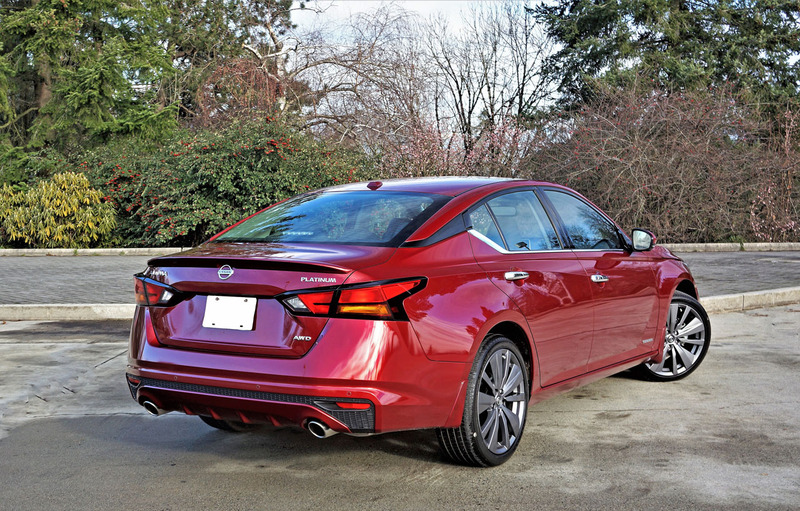 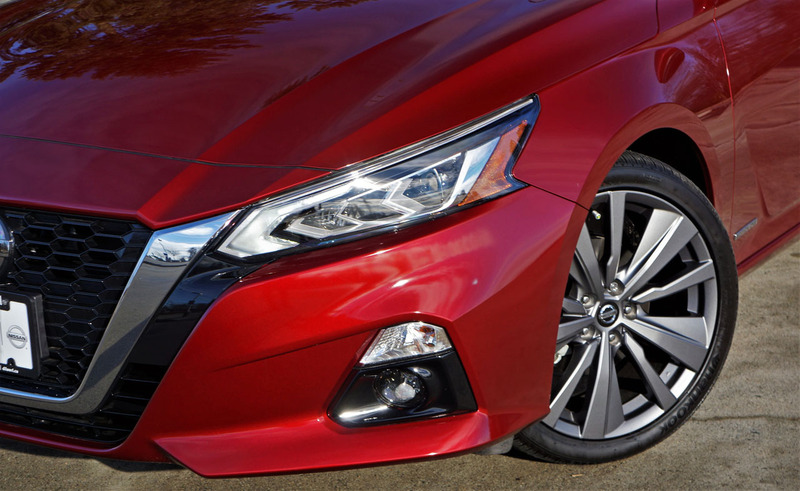 As for styling, the new 2019 Altima’s exterior design speaks for itself, and most should find its assertive new face to their liking. 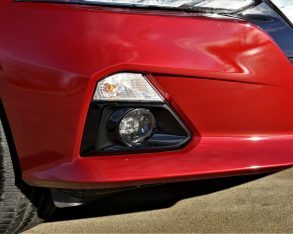 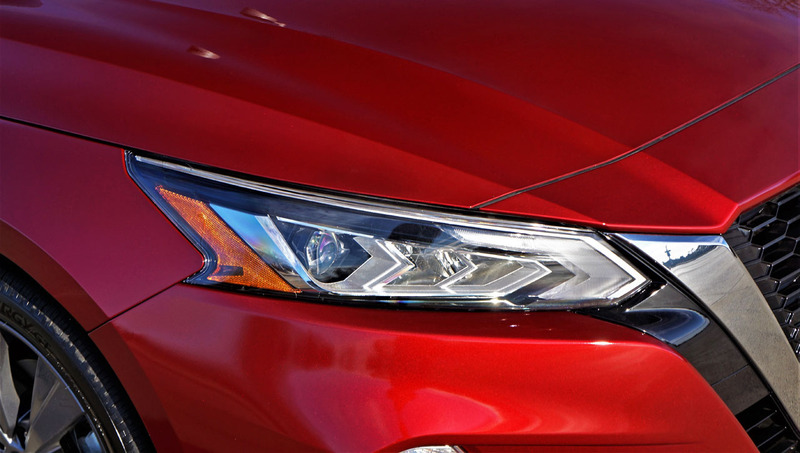 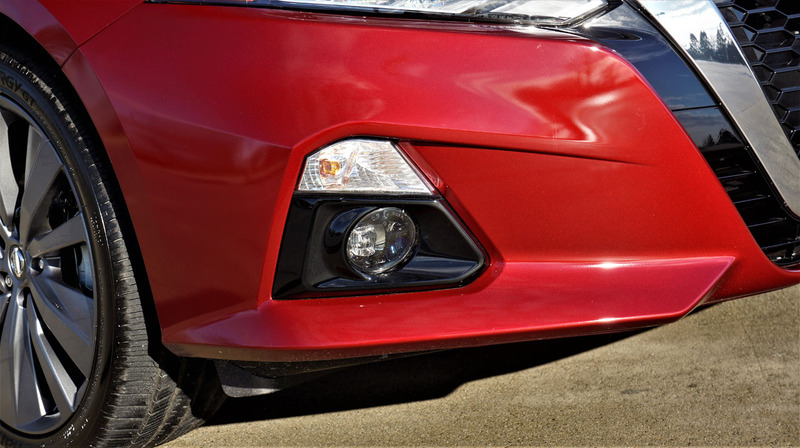 Its predominant feature is a go-big-or-go-home version of the brand’s Vmotion 2.0 grille, surrounded by those sleek new LED headlamps mentioned earlier, unless choosing the base S model that comes with a set of projector-type halogen headlights that are just as sleek, albeit not as bright, while the rest of the car portrays an athletic stance from front to back. 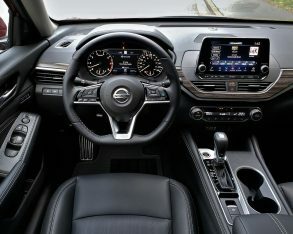 All said, the new Altima delivers big on style, interior design and execution up front, comfort and passenger roominess all-round, plus infotainment, handling, fuel economy, and advanced driver assistance systems, while its safety rating should at the very least measure up to its peers. 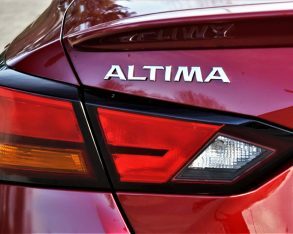 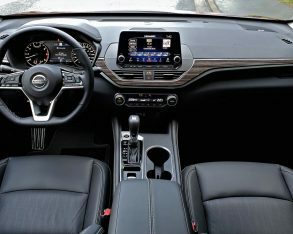 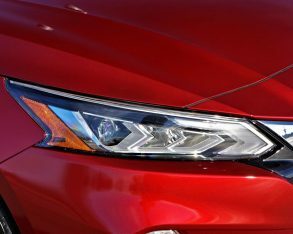 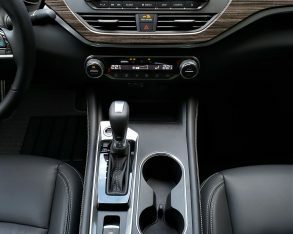 I don’t think Nissan has hit the new Altima out of the park, meaning the Camry and Accord should still reign supreme in the mid-size sedan segment, but it should satisfy most current Altima owners that aren’t already planning to upgrade to a Murano, Pathfinder, or some other crossover SUV like so many of today’s consumers are. 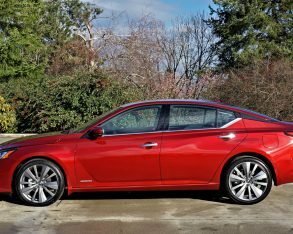 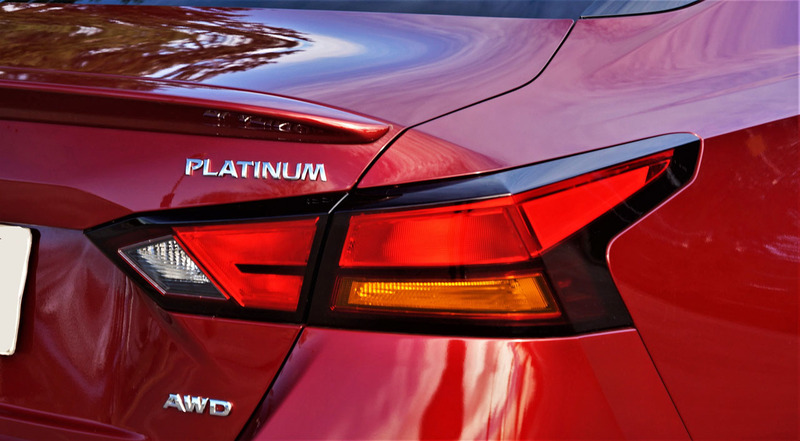 Then again, the all-season stability and safety that comes with standard AWD combined with the unmatched security of a lockable trunk should be considered, and the new Altima is one of few vehicles on today’s mainstream volume-branded market providing both.